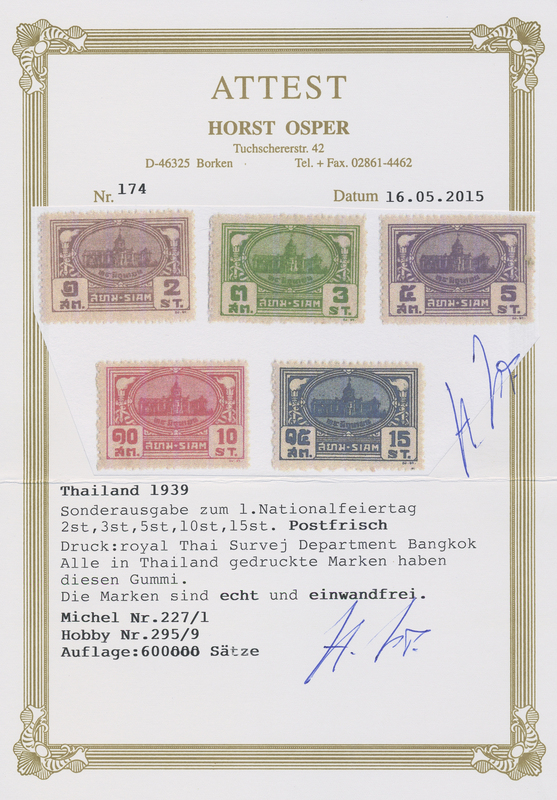 9843 postfrisch (never hinged) ** 176 (60) 1921, Scouts, 2s. 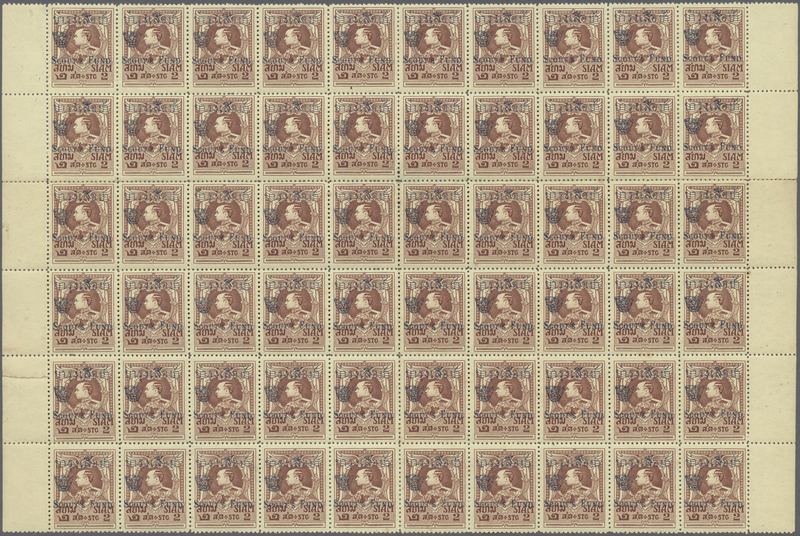 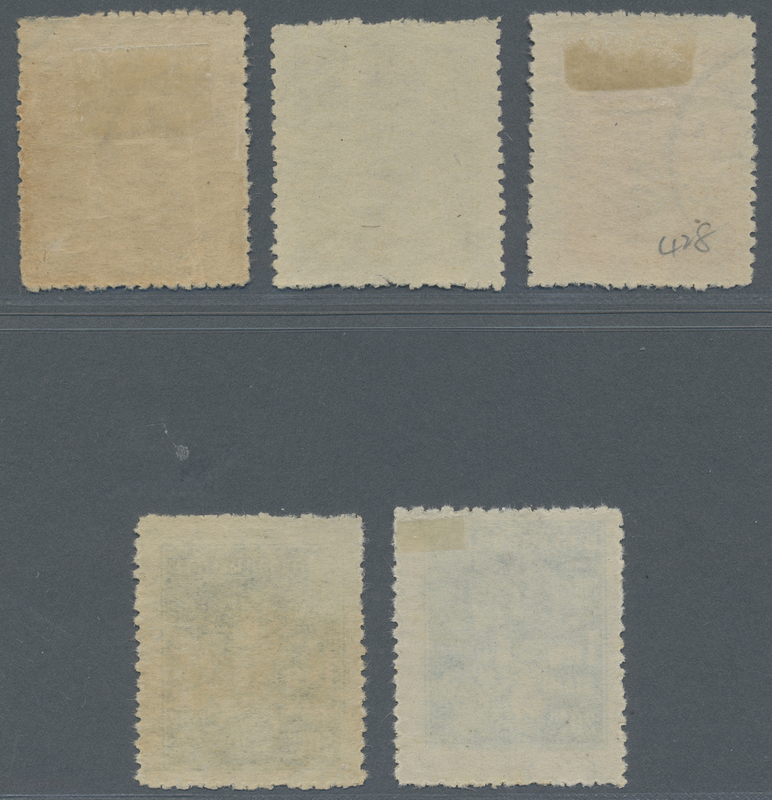 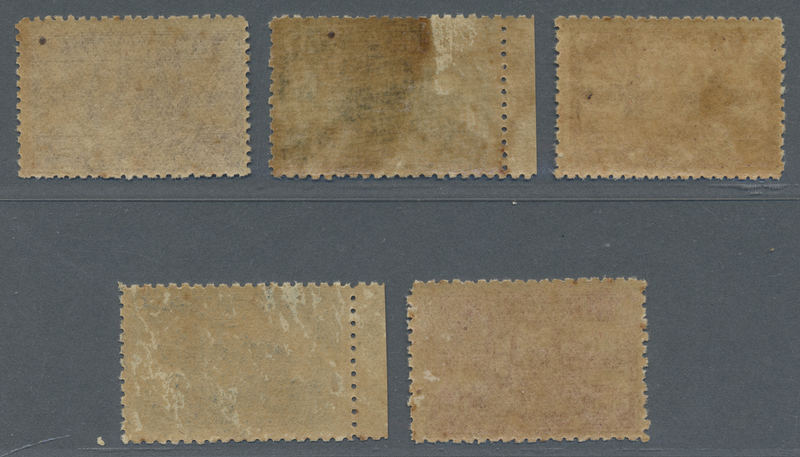 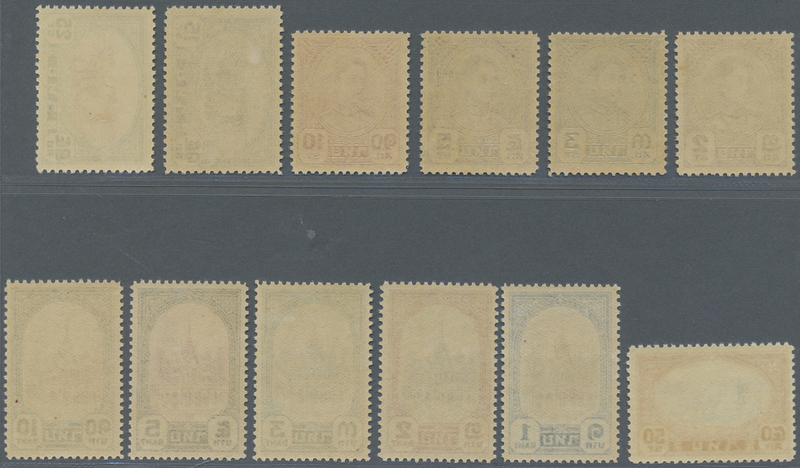 brown on yellow, block of 60 stamps with selvedge at right/at left (folded/slightly separated), unmounted mint with oval control handstamp on reverse, few toning spots, extremely fresh and rare multiple! 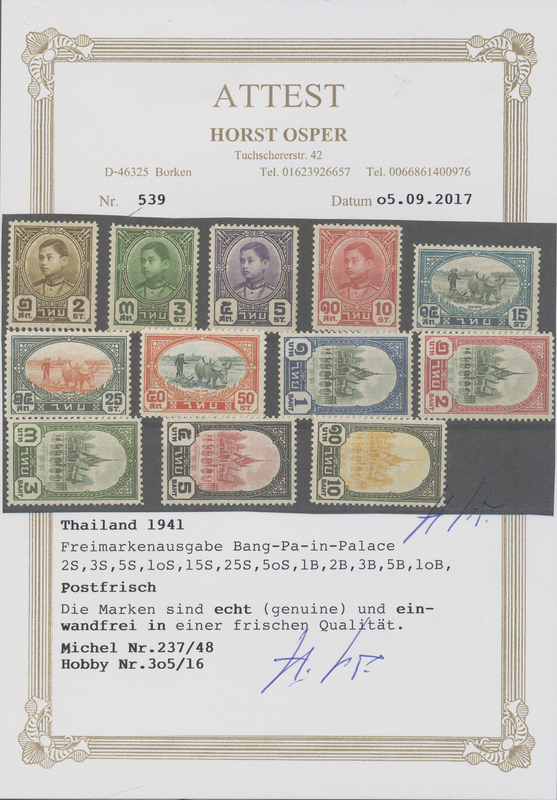 9844 postfrisch (never hinged) ** 177 (60) 1921, Scouts, 3s. 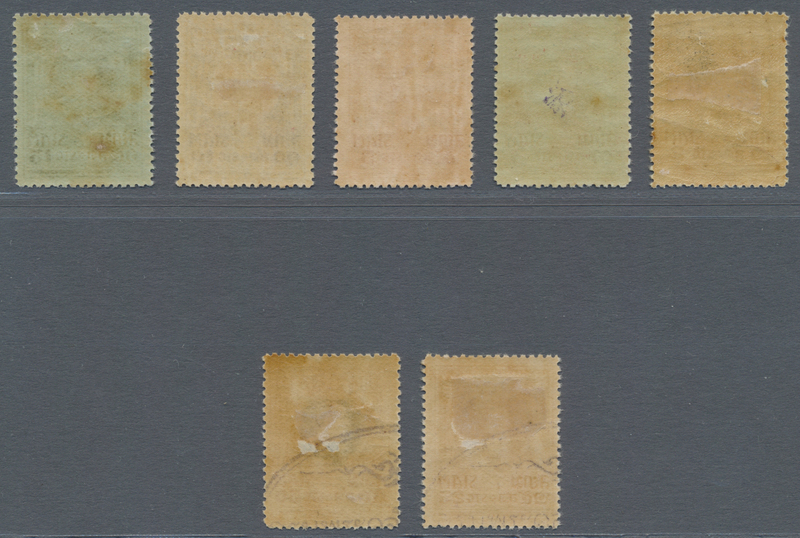 green on greenish, block of 60 stamps with selvedge at right/at left (folded/slightly separated), unmounted mint with oval control handstamp on reverse, few toning spots, extremely fresh and rare multiple! 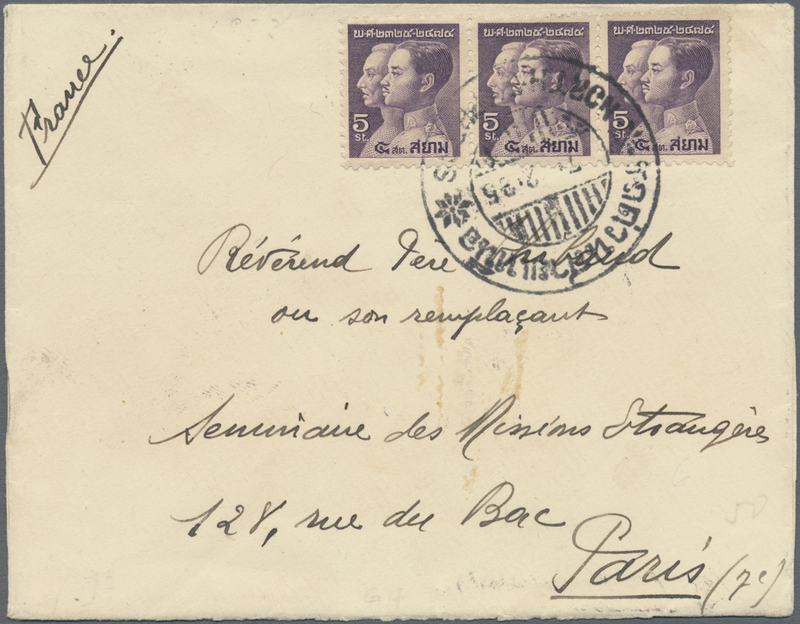 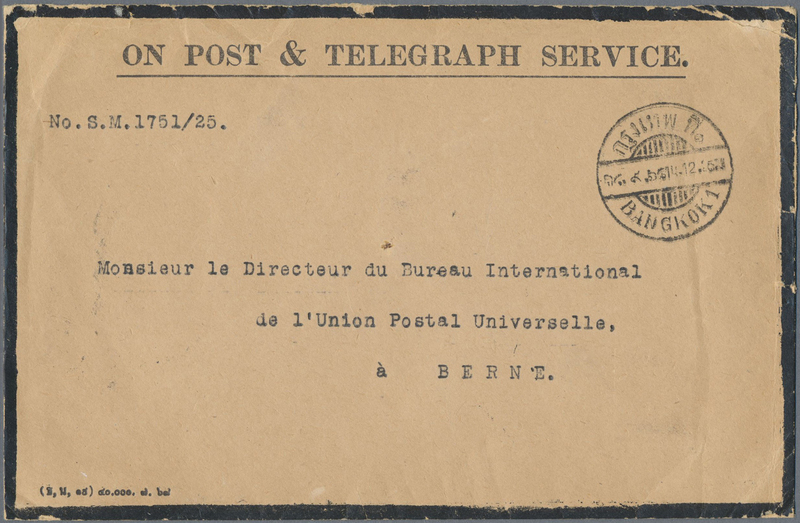 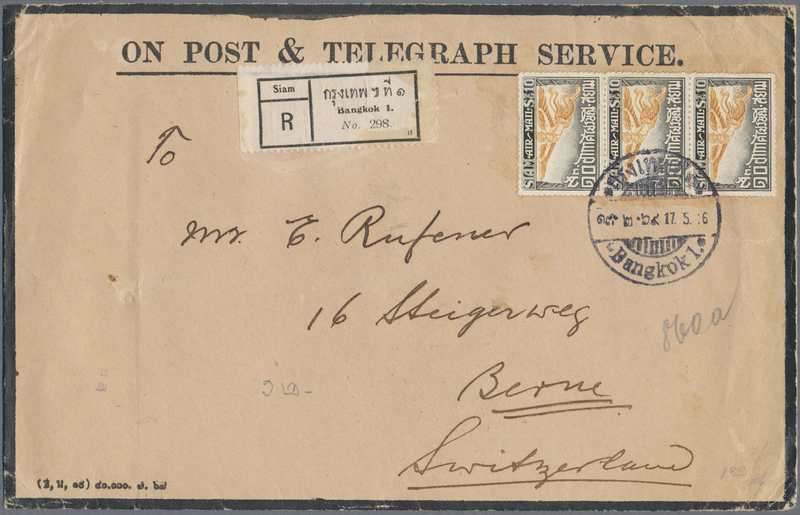 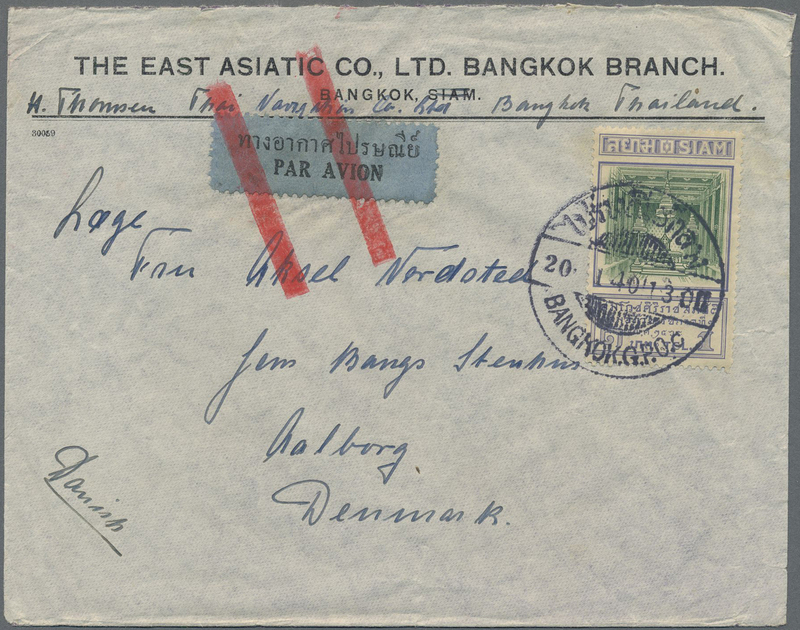 9847 Brief (cover) 186 (3), 171 (2) 1925-27 Two 'On Post & Telegraph Service' official mourning envelopes from Bangkok to Berne, Switzerland, with 1926 stampless cover to the Director of the UPU International Bureau, and 1926 registered airmail cover franked by 1925 airmail stamp 10s. 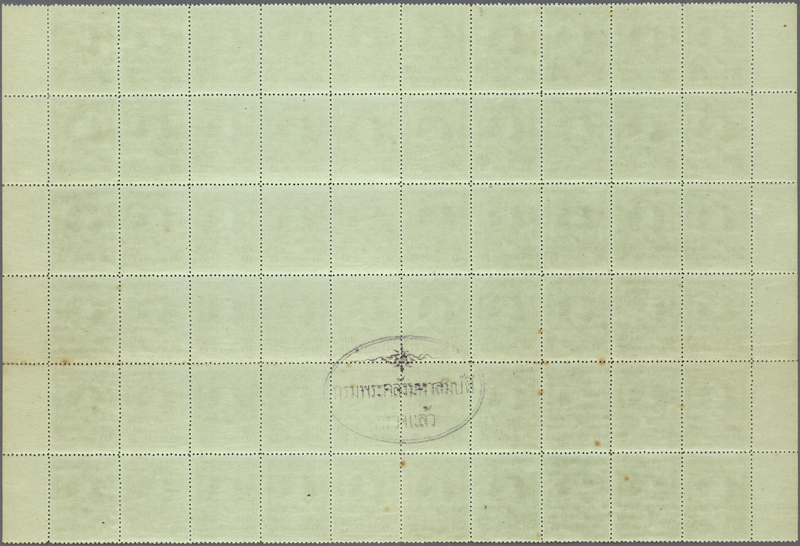 vert. 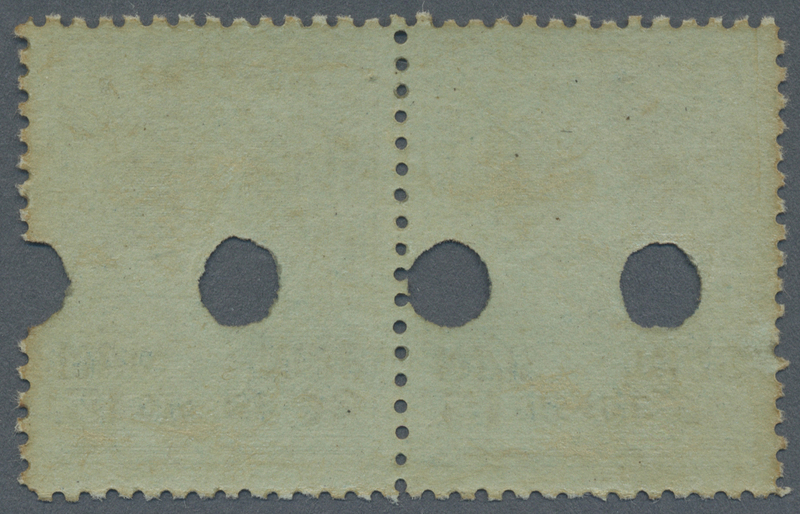 strip of three, fine. 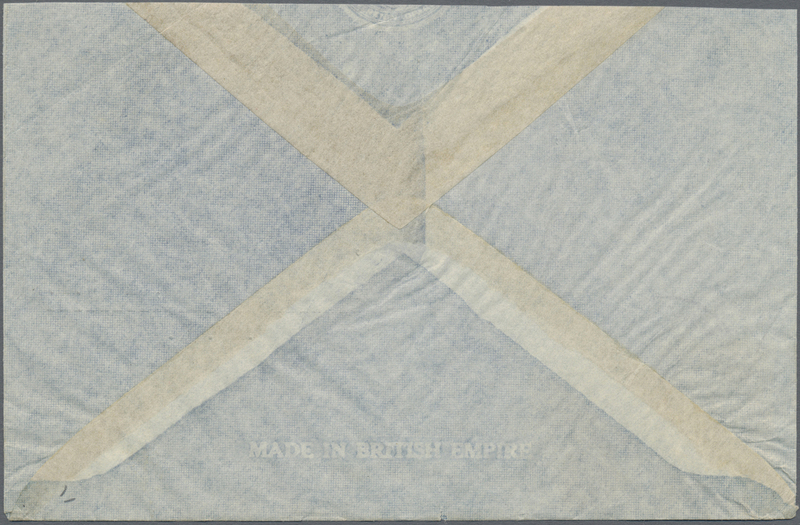 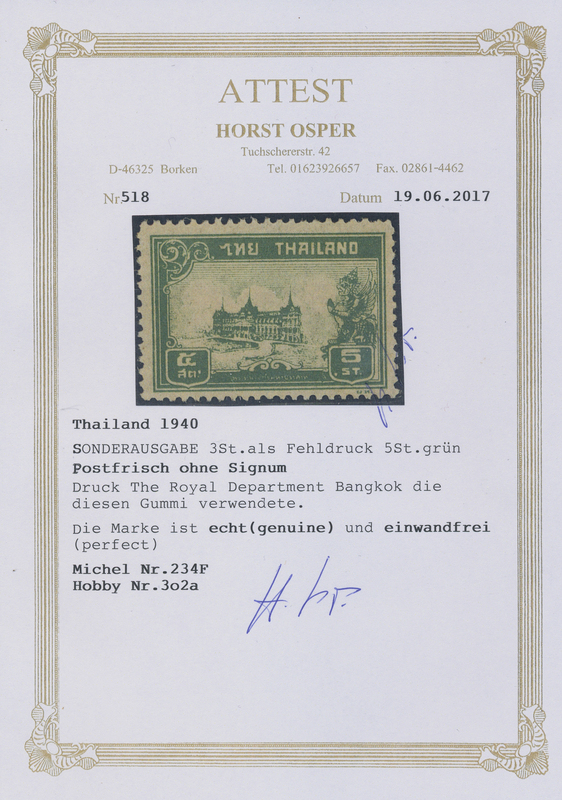 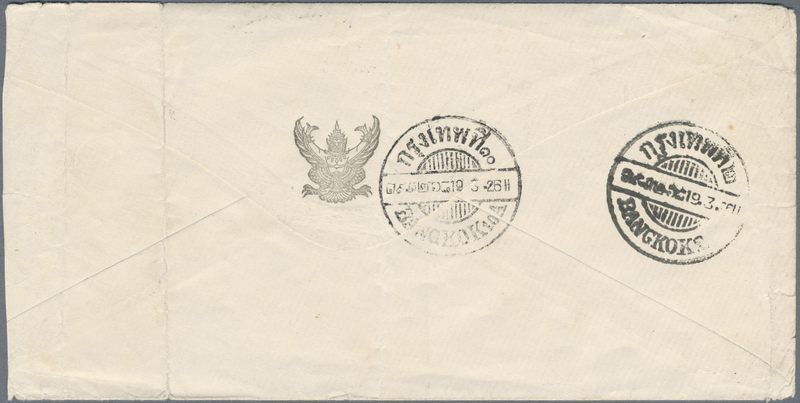 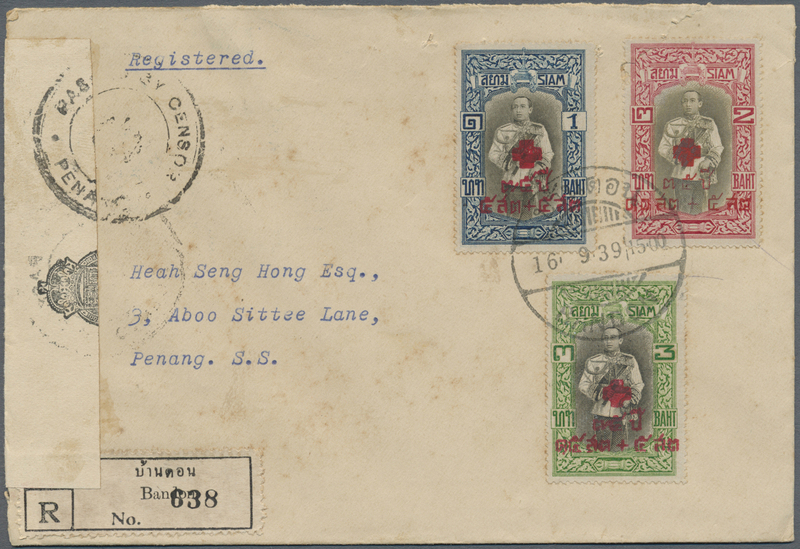 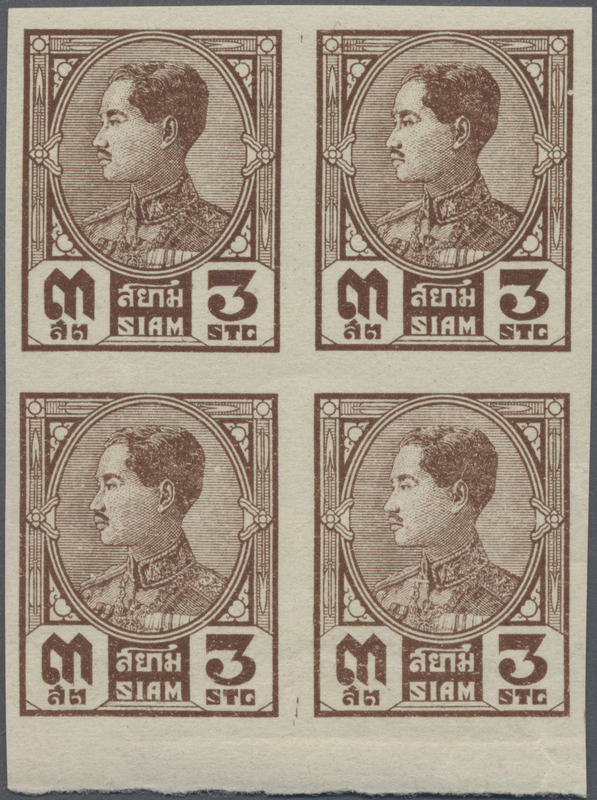 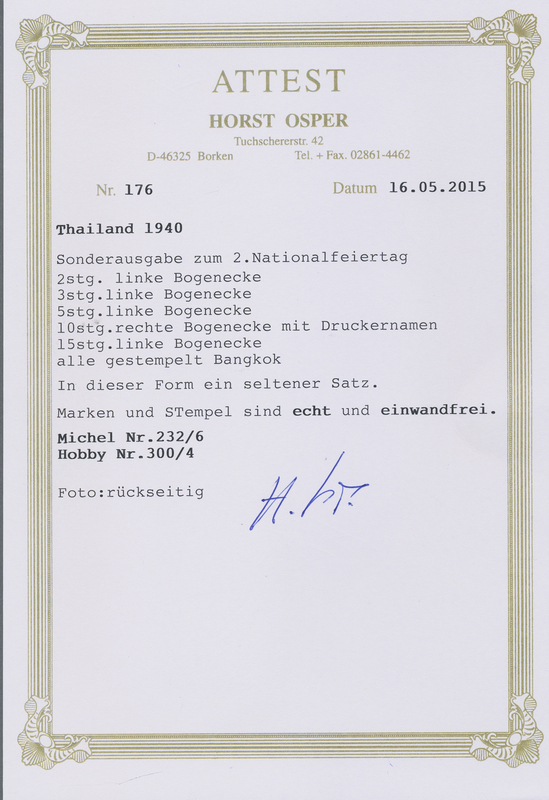 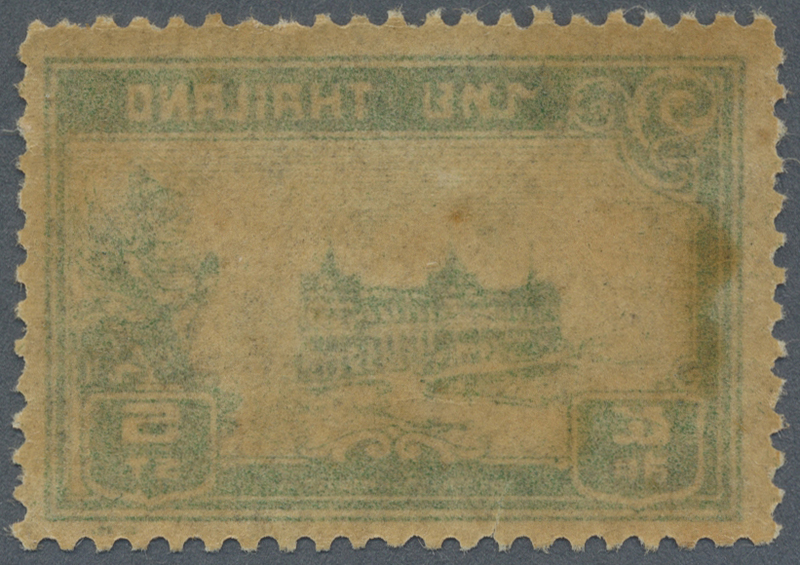 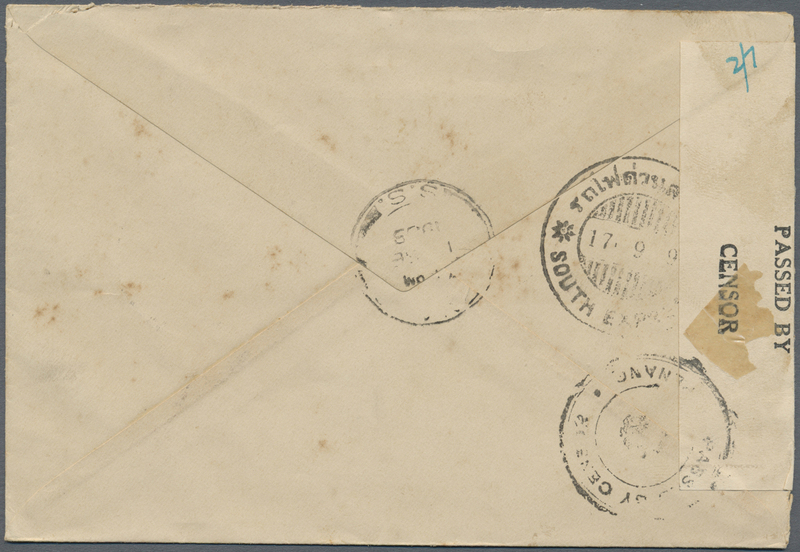 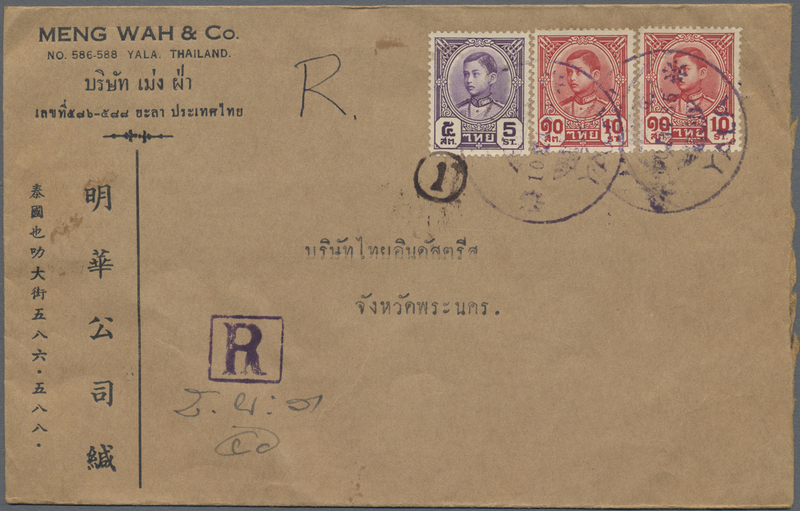 Plus top fragment of registered mourning cover from Bangkok to one H.R.H. 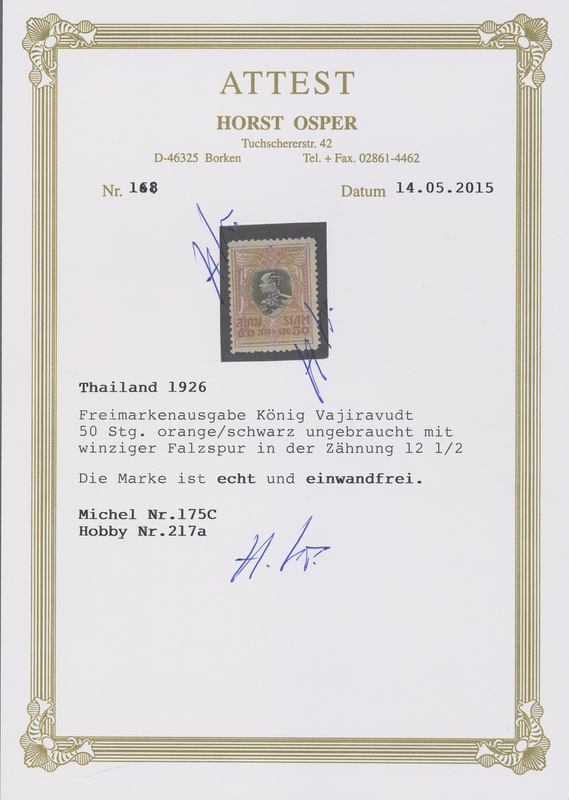 of Prussia (Germany) franked 1920 15s. 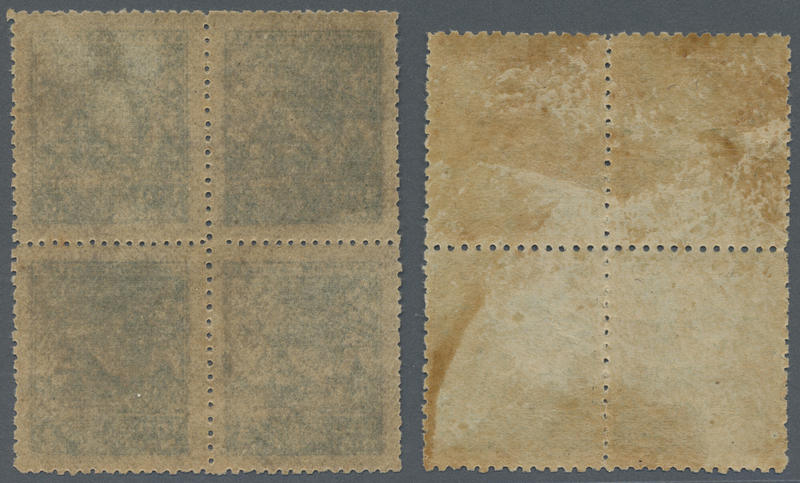 pair. 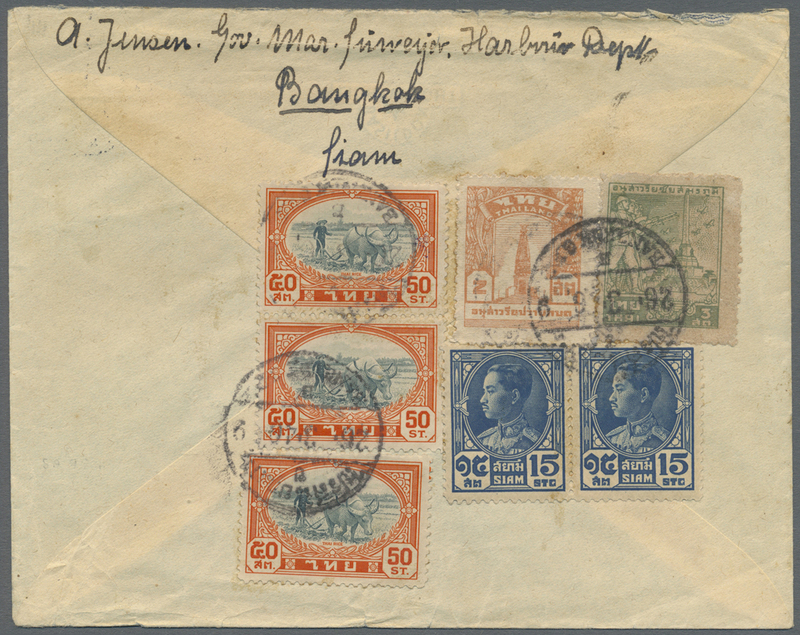 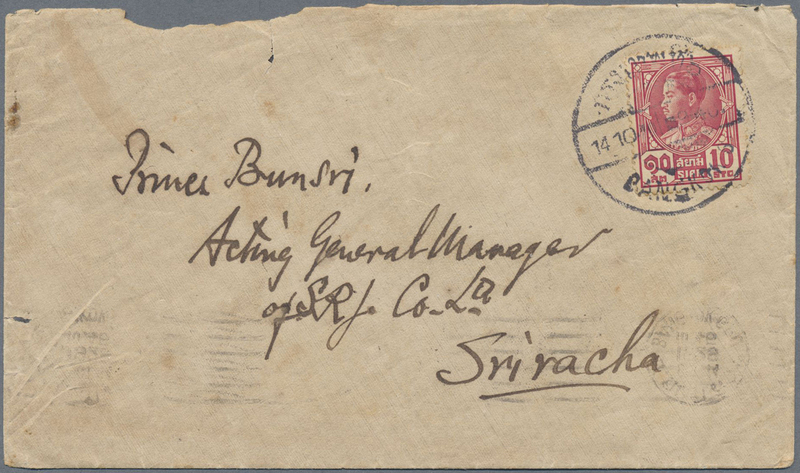 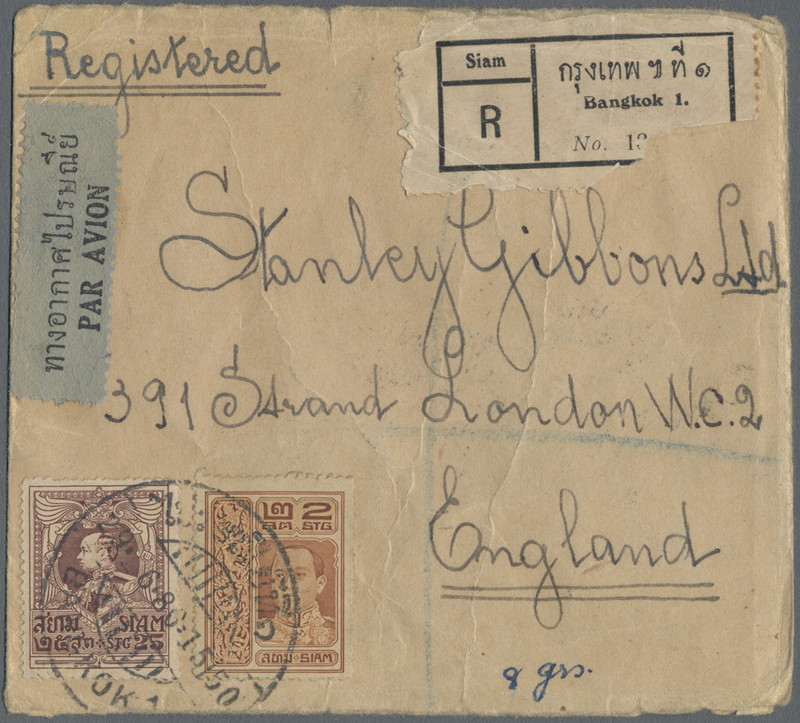 9849 Brief (cover) 186, 202 1926/1929 Two domestic mourning covers, with 1926 cover from Samudasagor to Bangkok franked by 1925 Air 10s., reduced at left and slightly creased, and 1929 Royal mourning cover from Bangkok to Sriraja, franked 1928 10s., and on the reverse with the "Swastica" and Thai word "2nd Palace", opened roughly otherwise fine. 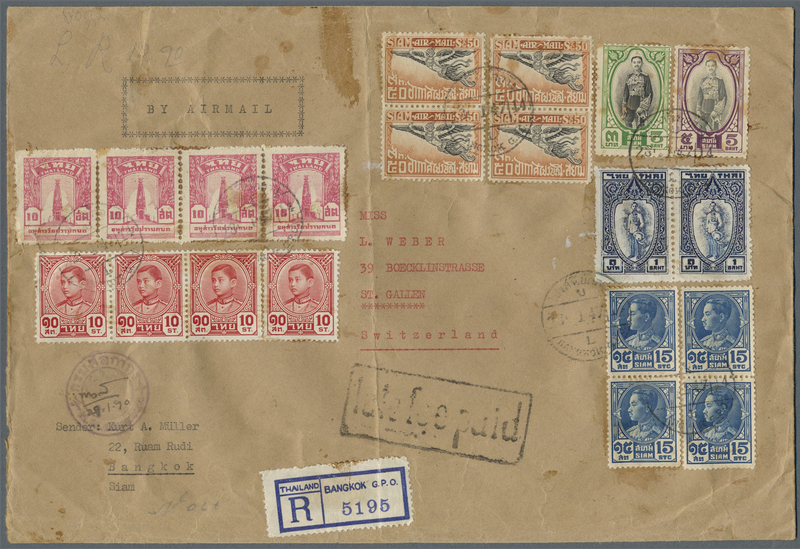 9851 Brief (cover) 206+208 1928 Definitives 80c black & pale blue and 2b. 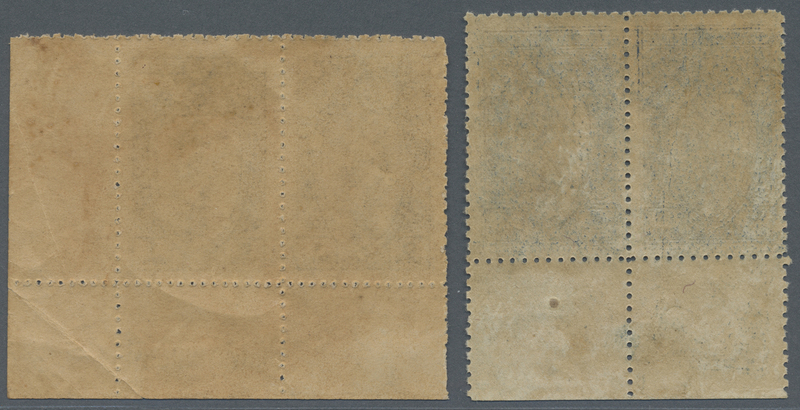 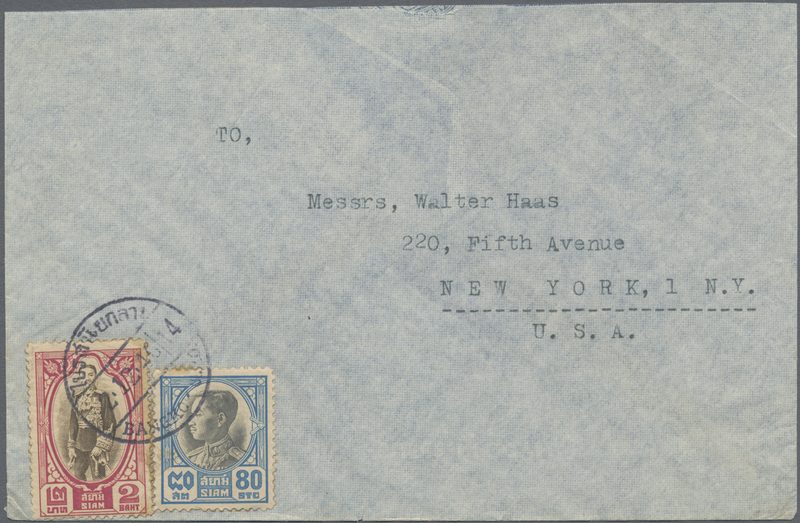 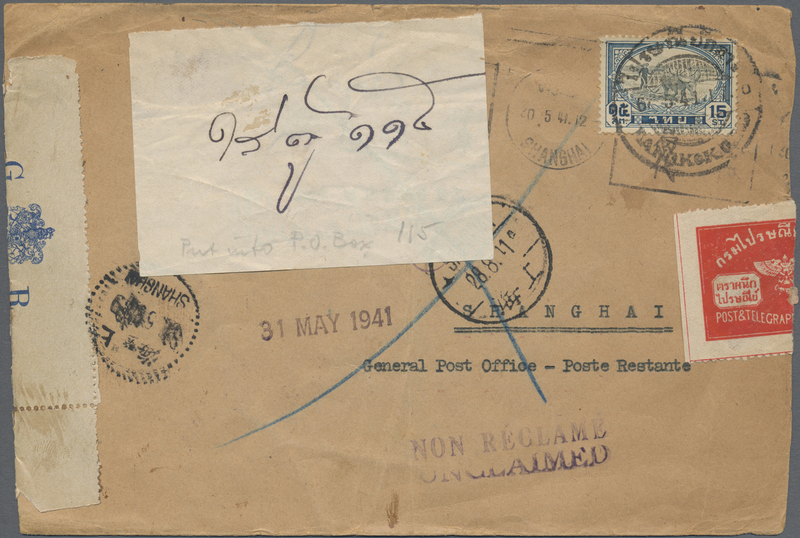 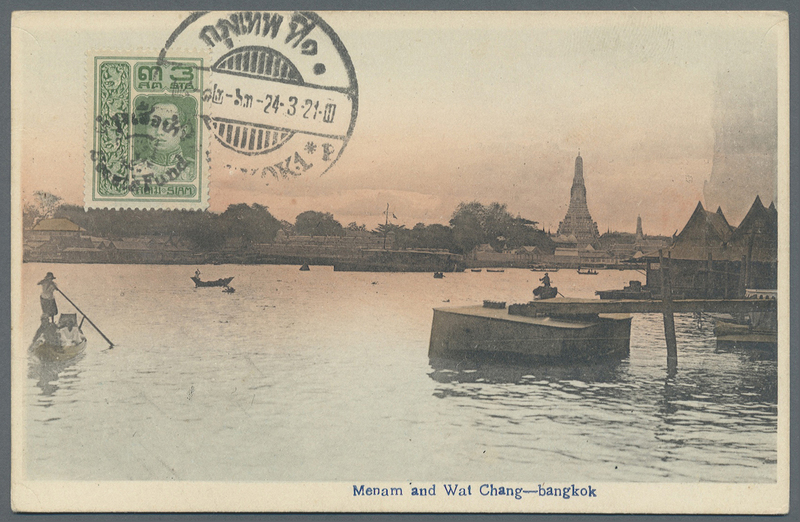 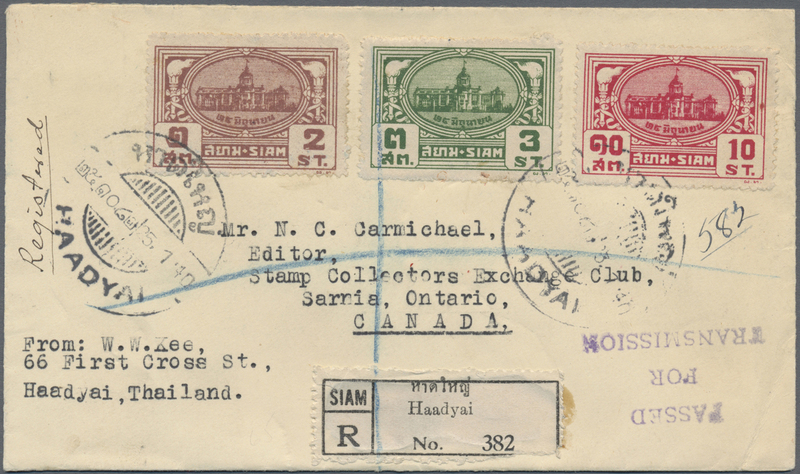 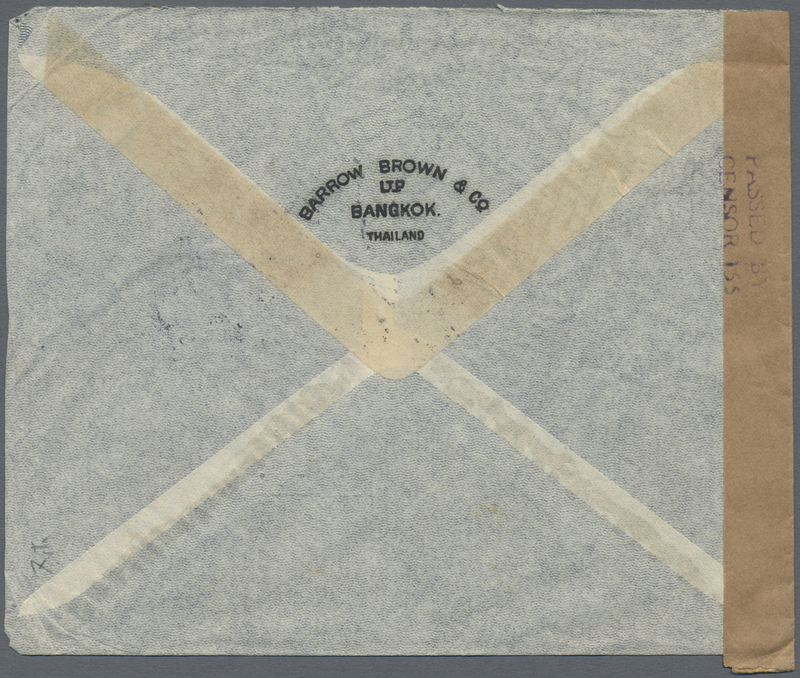 brown & carmine used on cover (shortened on top) from Bangkok to New York, cancelled by bilingual Bangkok 2.12.46 cds, fine. 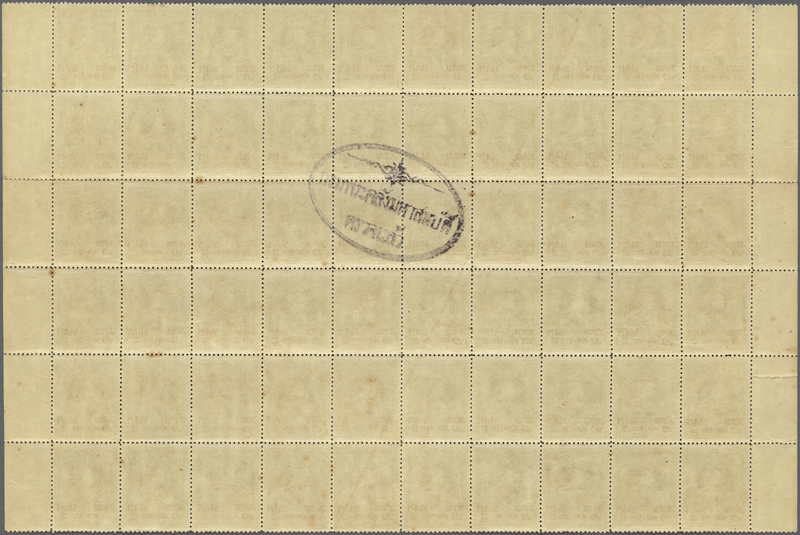 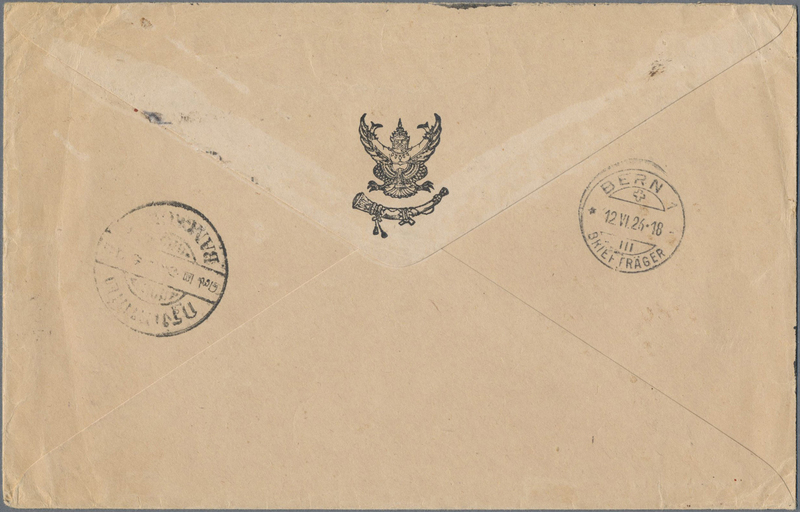 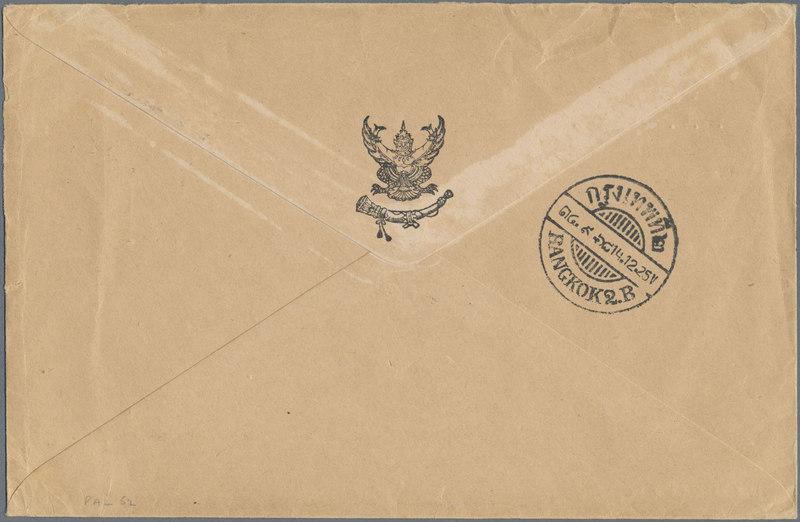 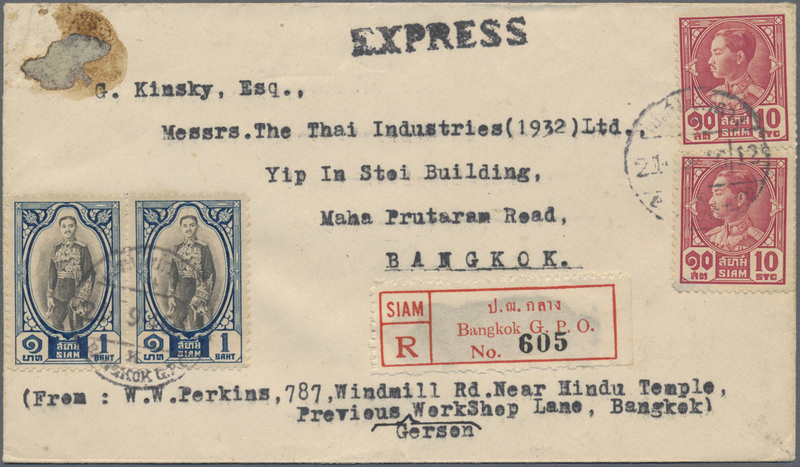 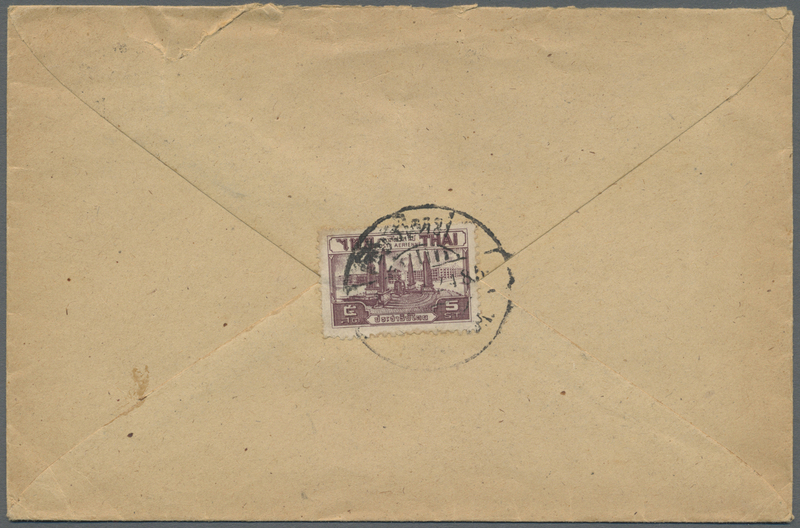 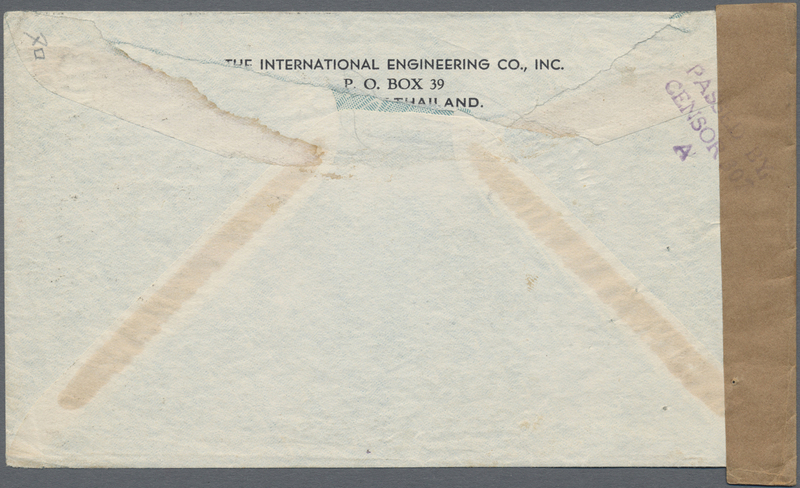 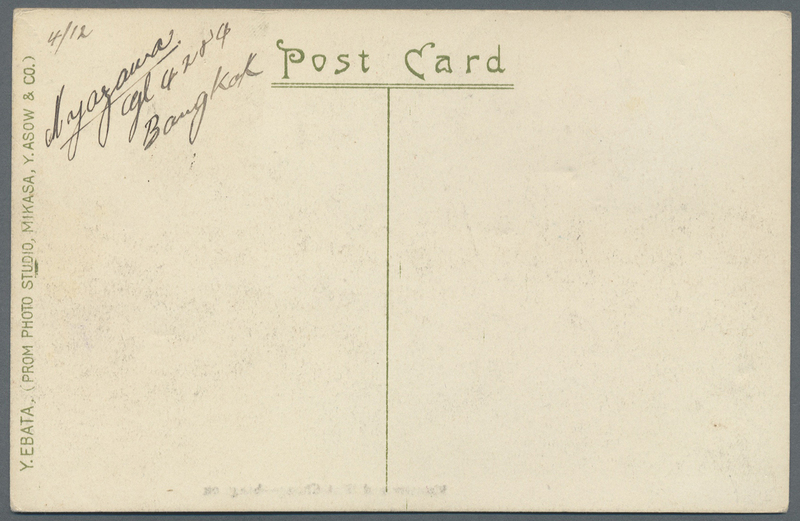 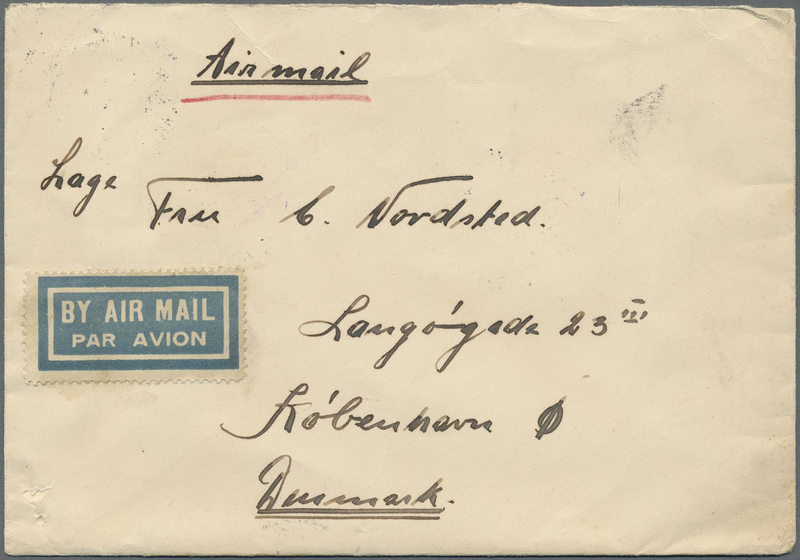 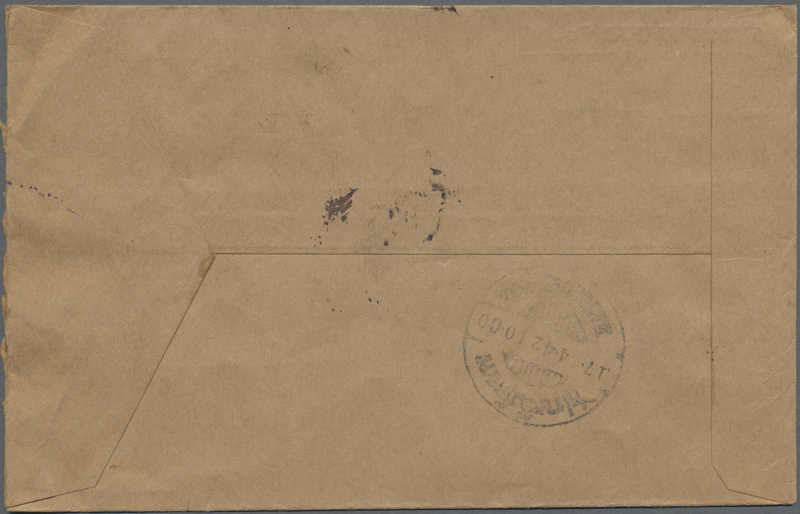 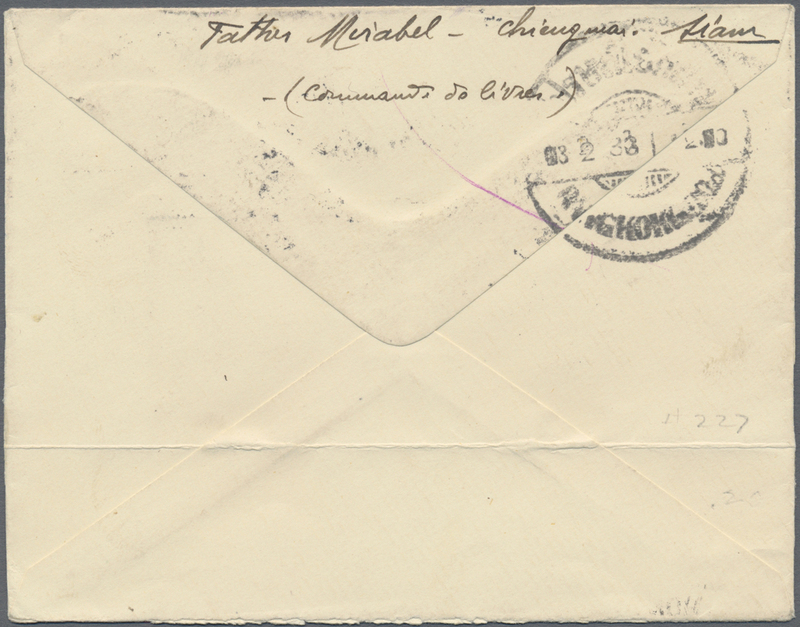 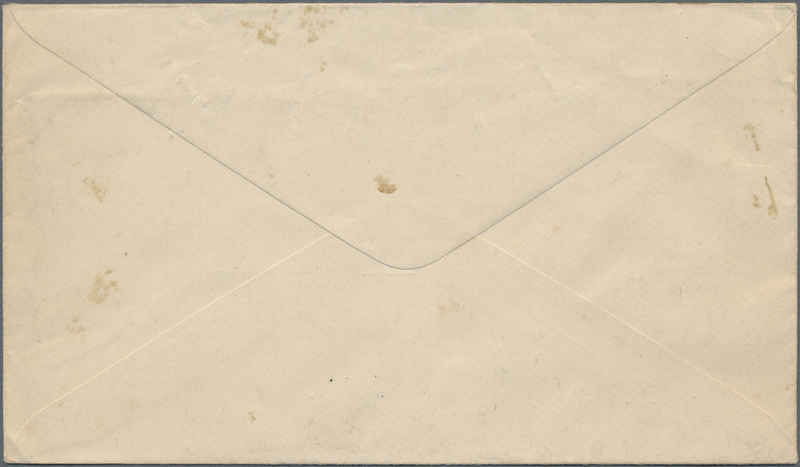 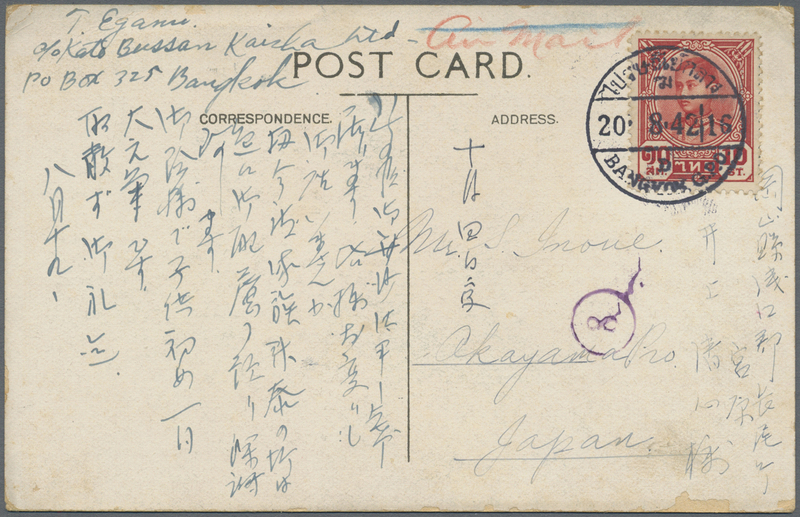 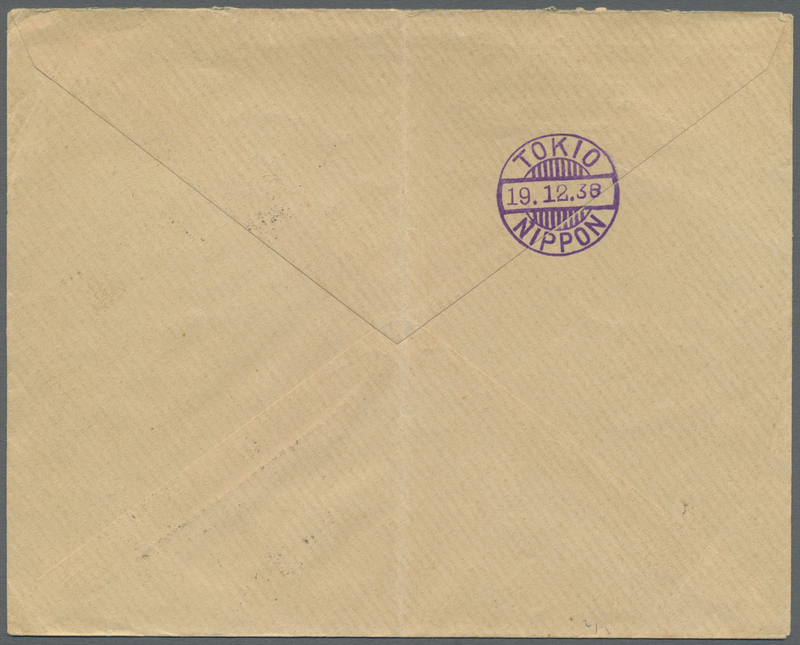 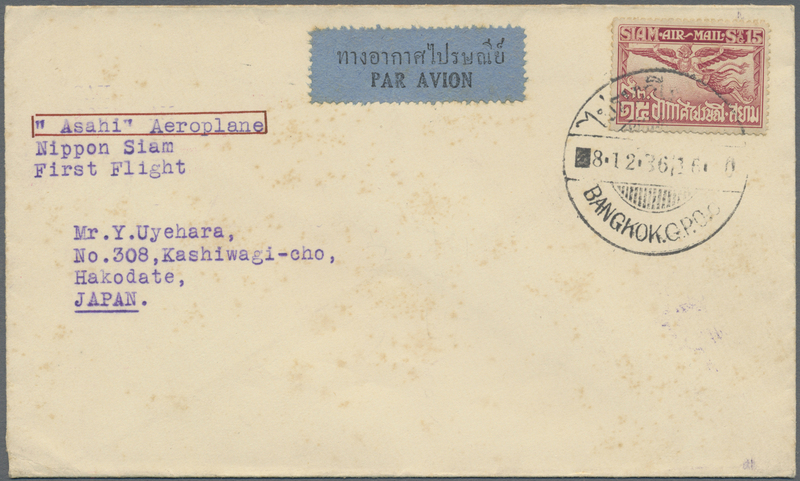 9855 Flugpostbrief (Flight cover) 1936, FFC pioneer flight by "Asahai" to Japan, 15 S. airmail tied "BANGKOK.G.P.O. 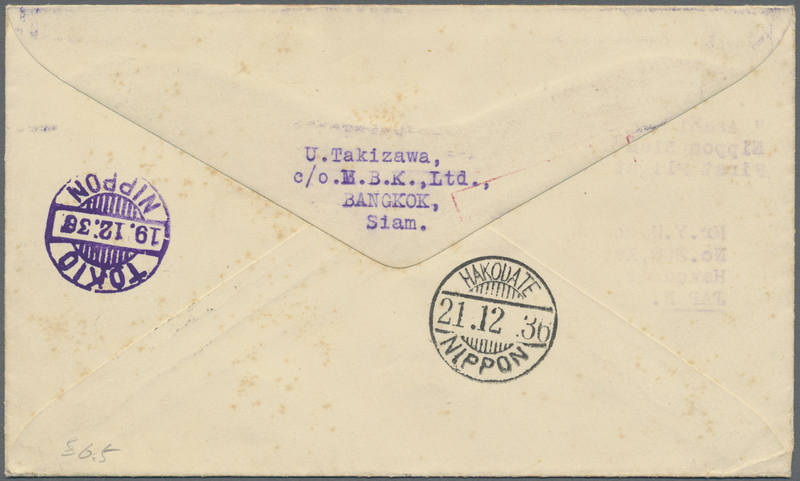 8.12.36" to Hakodate, transit "TOKIO 19.12.35", arrival "HAKODATE 21.12.36", small stains. 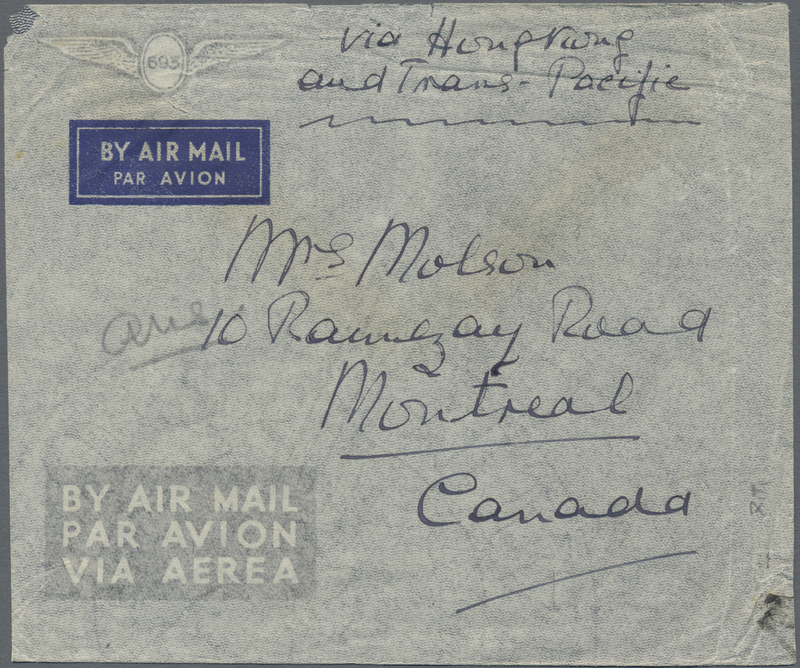 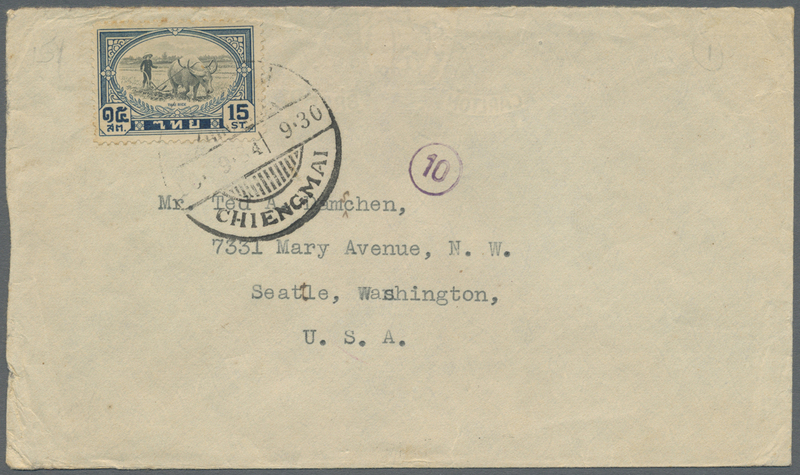 9860 Brief (cover) 188(6), 230, 234 1940 Airmail cover from Chiengmai to Montreal, CANADA 'Via Hongkong and Trans-Pacific' (endorsed in m/s), franked on the reverse by 1925-37 Air 25s. 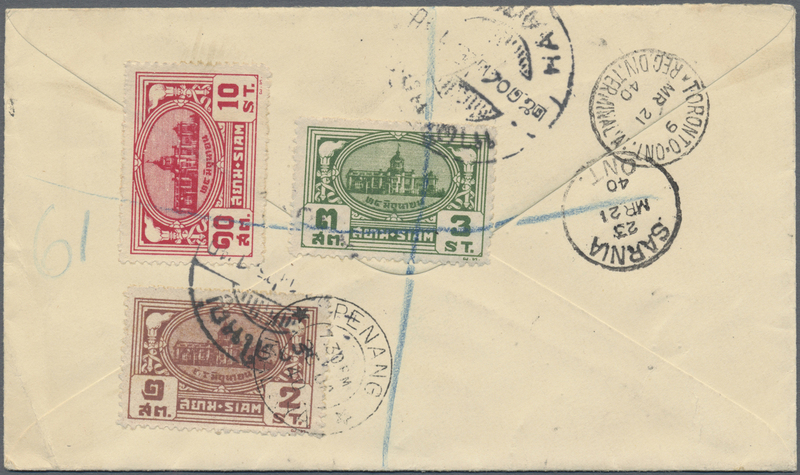 two vertical strips of three, 1939 10s. 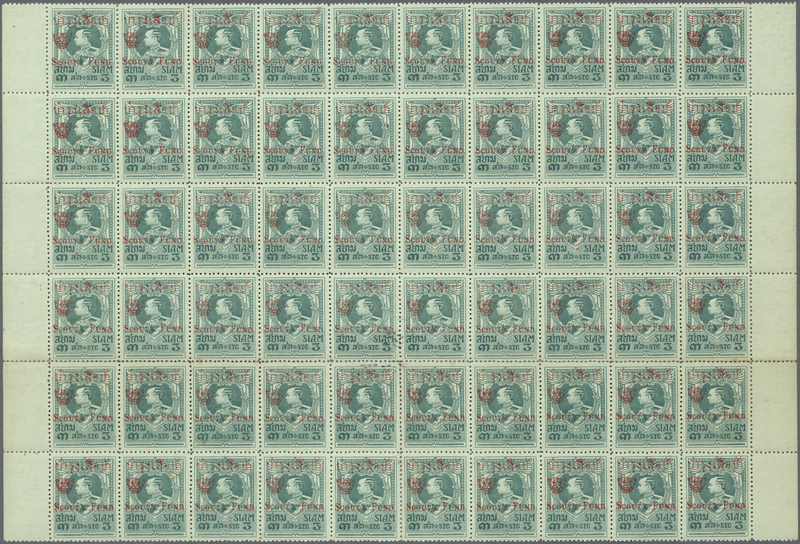 and 1940 5s. 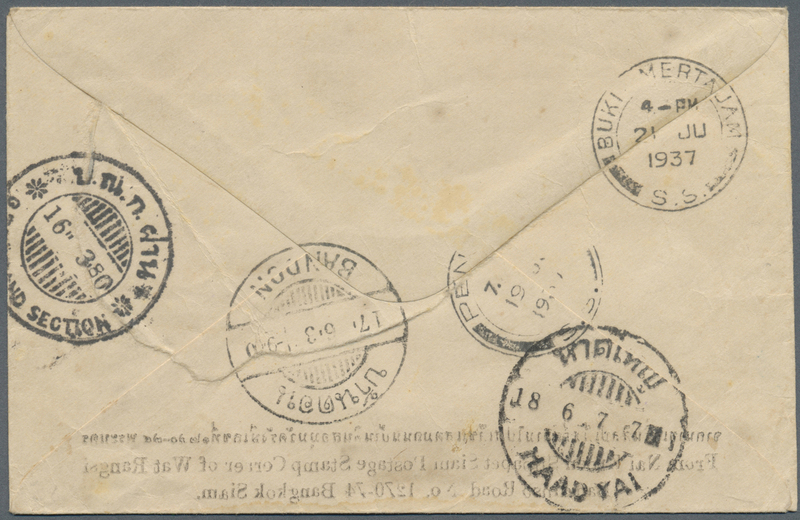 all tied by bilingual "CHIENGMAI/20.9.40" cds and native Bangkok slogan datestamp. 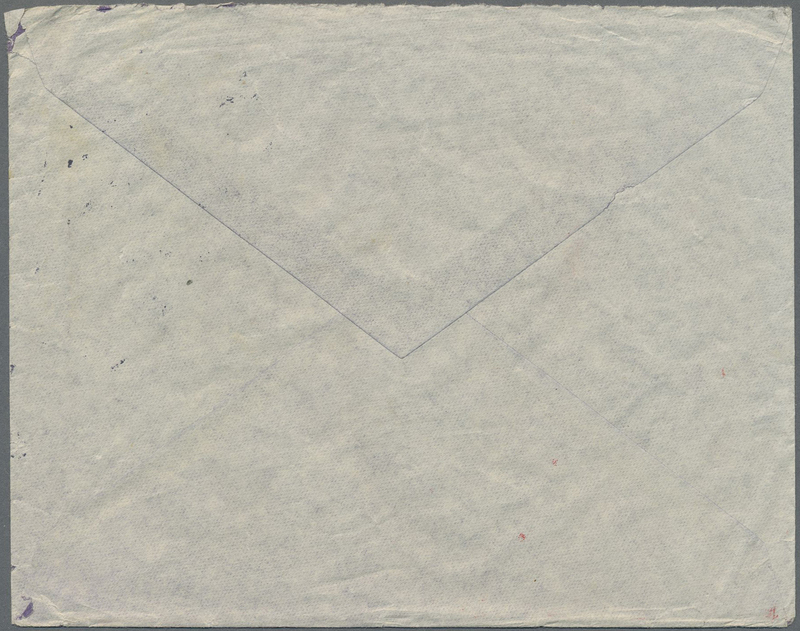 Envelope with minor imperfections but still good. 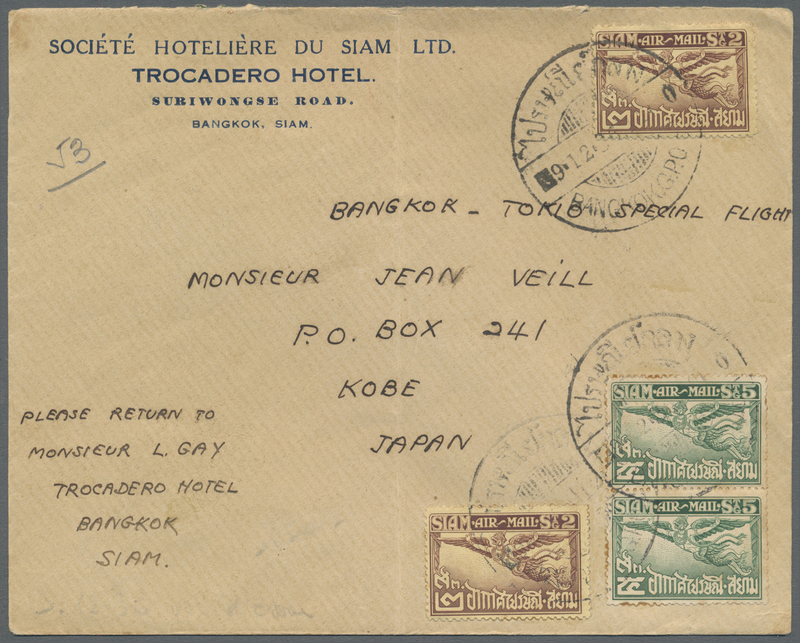 An interesting WWII Trans-Pacific cover. 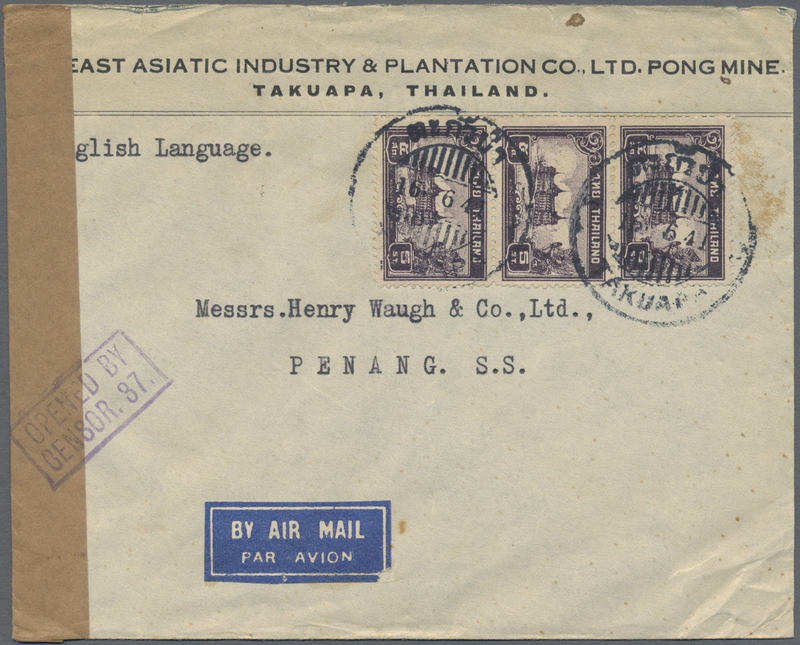 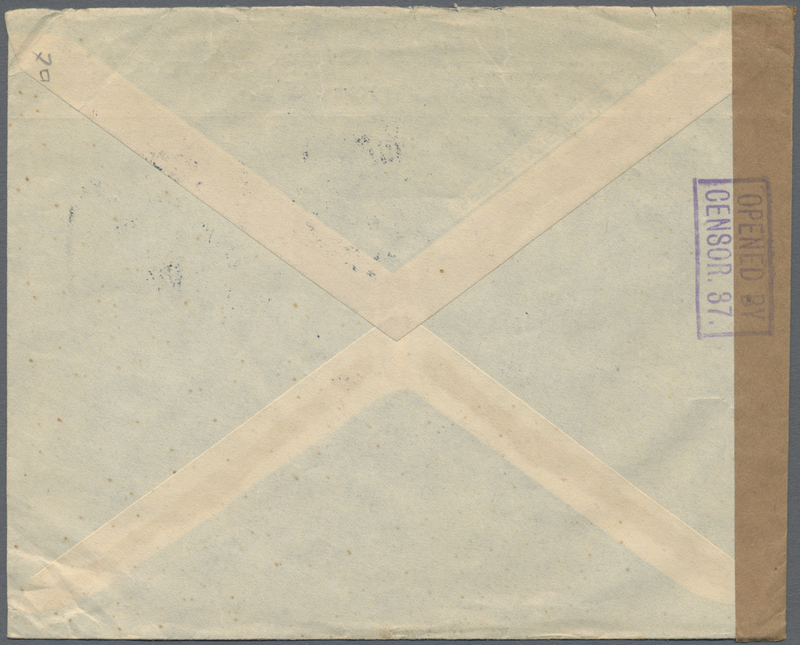 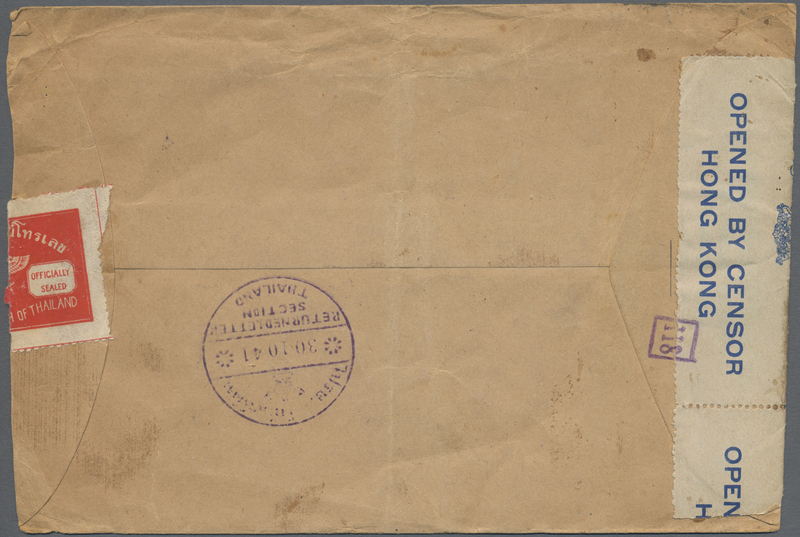 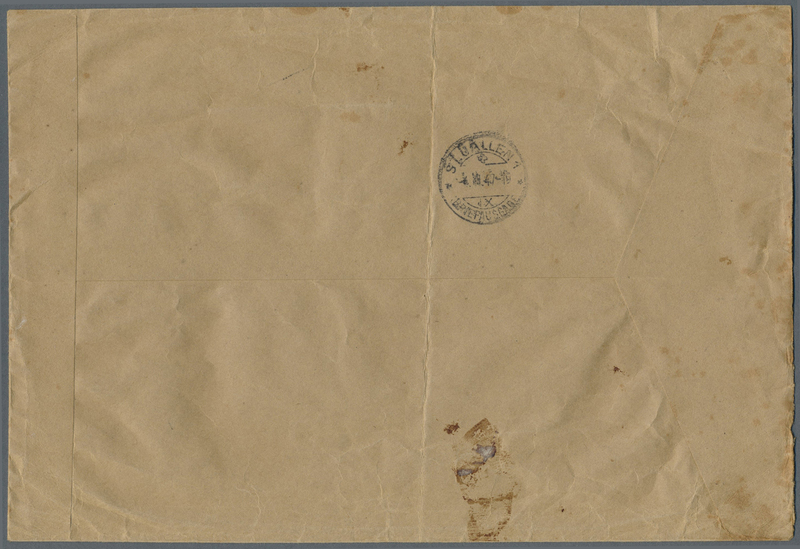 9864 Brief (cover) 234(3) 1941 Censored airmail cover from Takuapa to Penang, franked by 1940 5s. 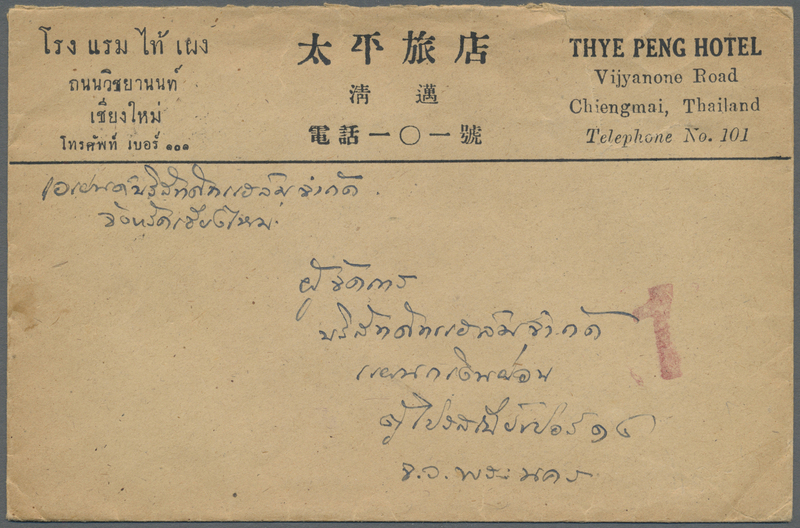 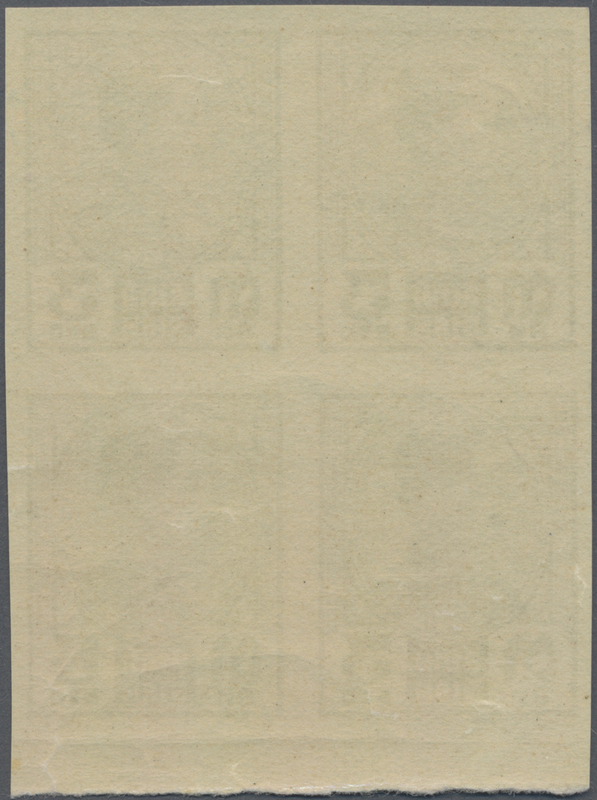 vertical strip of three tied by bilingual Takuapa '16.6.41' cds, with censor strip tied by boxed "OPENED BY/CENSOR. 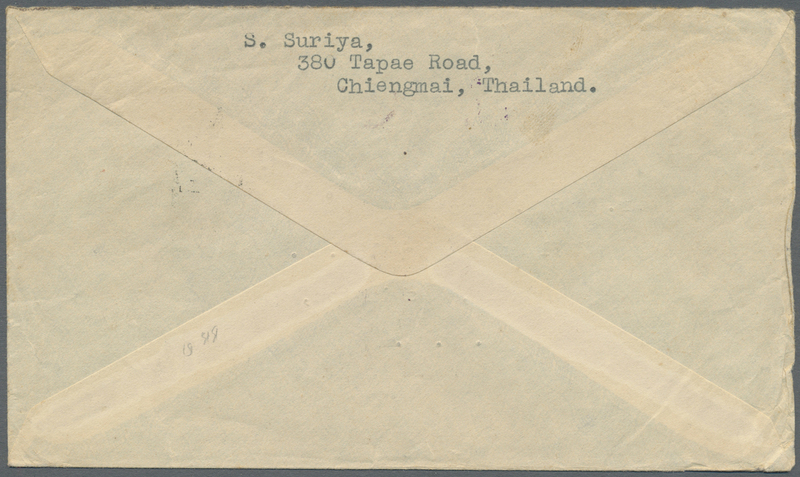 37." 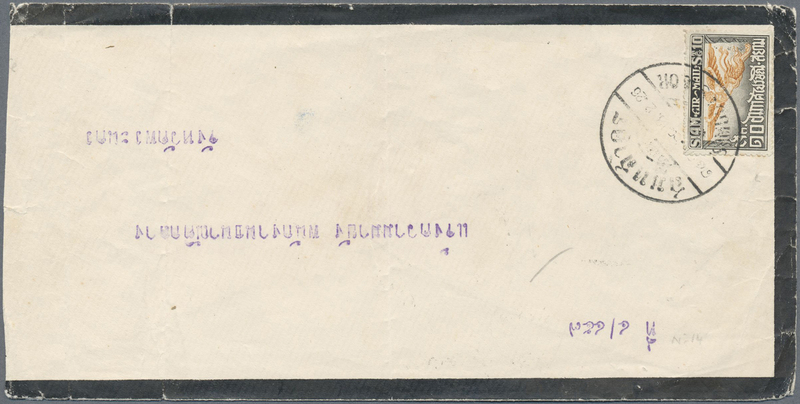 h/s in violet, fine. 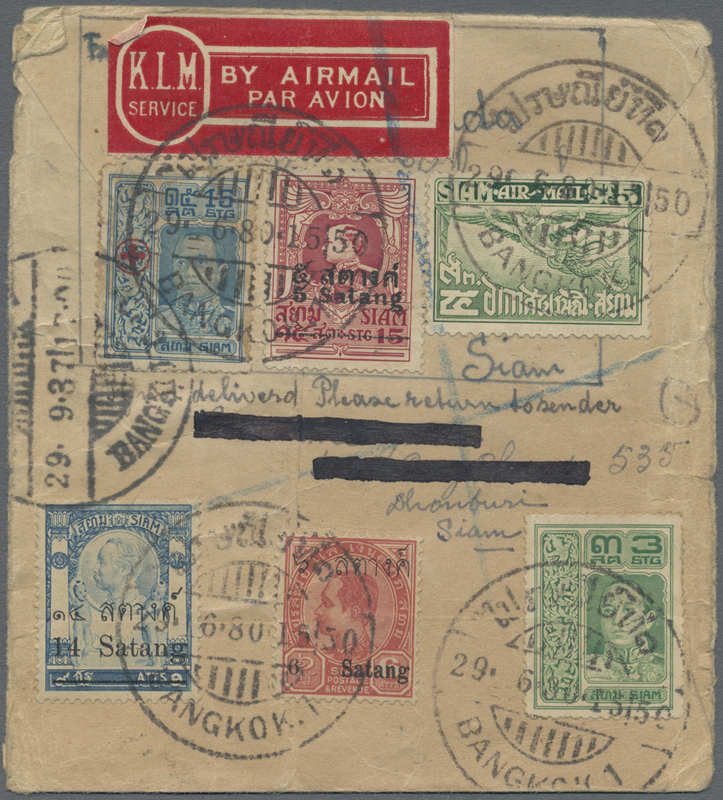 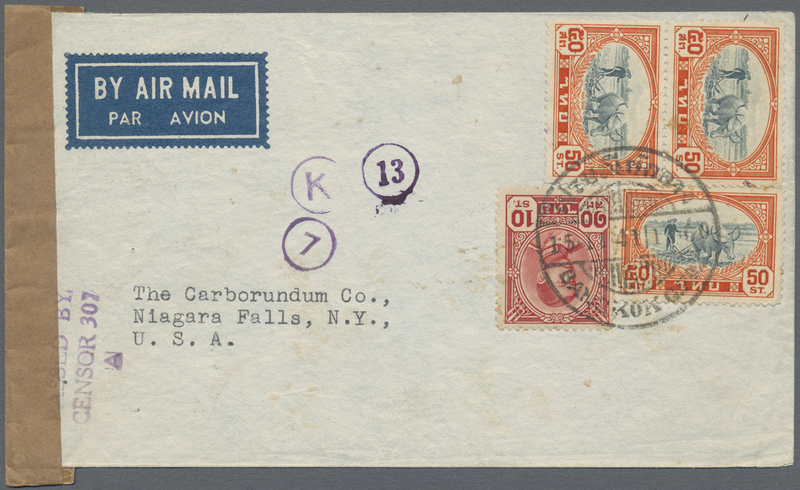 9866 Brief (cover) 242(8), 243(2) 1941 Censored airmail cover from Bangkok to New York 'By KLM Airways via Auckland & Clipper Service - Air Borne Throughout -" (typewritten in red), franked by 1941 25s. 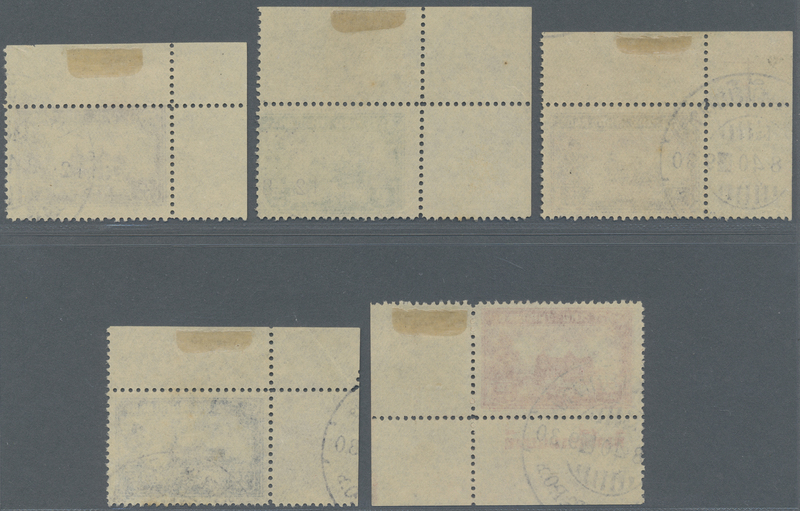 (8) and two singles of 50s. 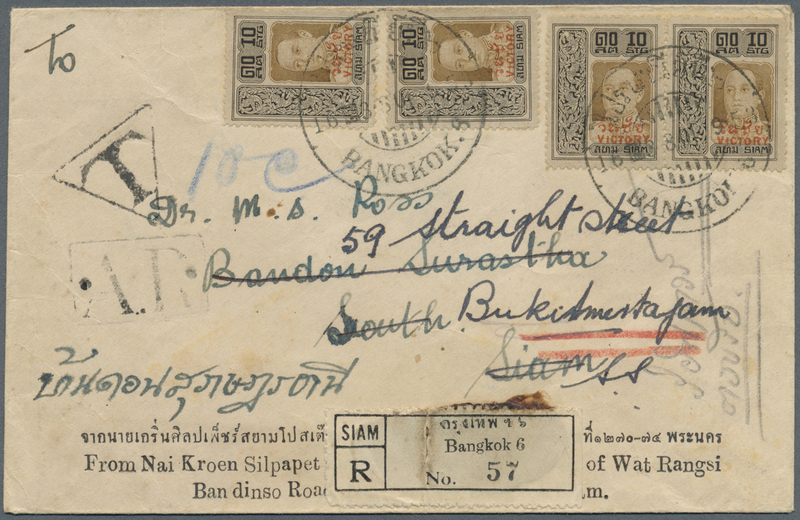 all tied by Bangkok '9.8.41' cds, with censor strip tied by "PASSED BY/CENSOR 155" h/s in violet, fine. 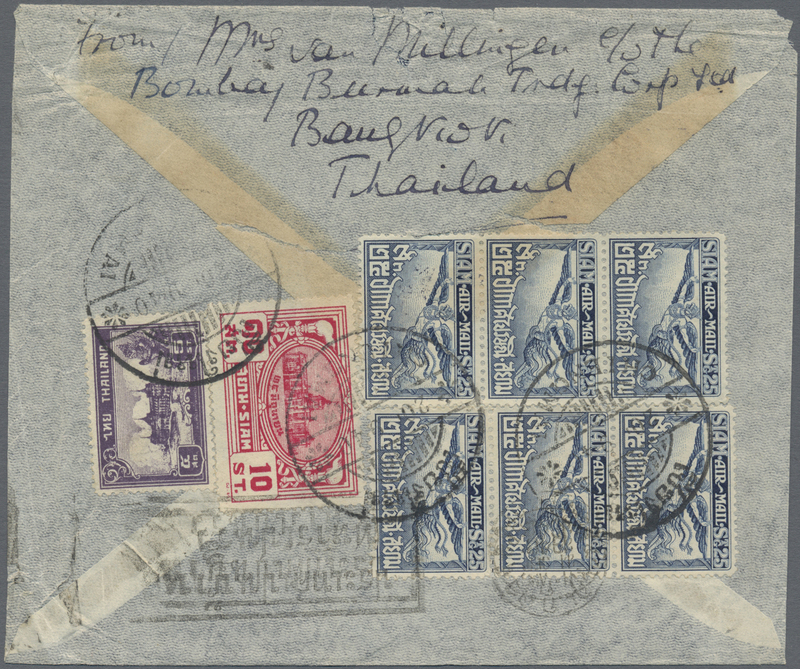 9867 Brief (cover) 243(3), 240 1941 Censored airmail cover from Bangkok to Niagara Falls, U.S.A. franked by 1941 50s. 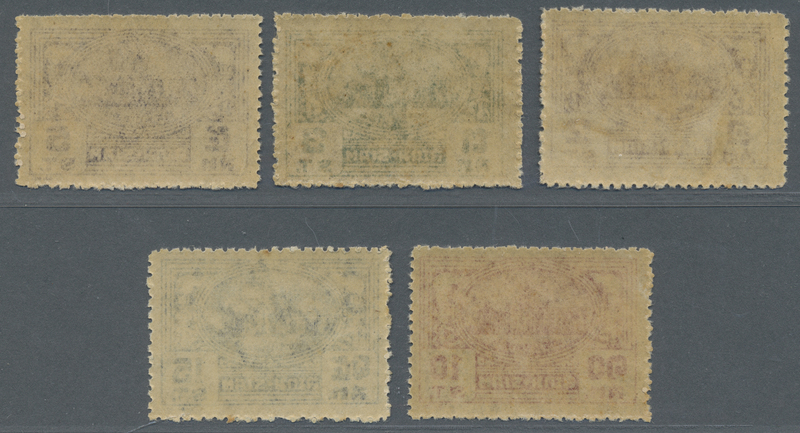 pair and single plus 10s. 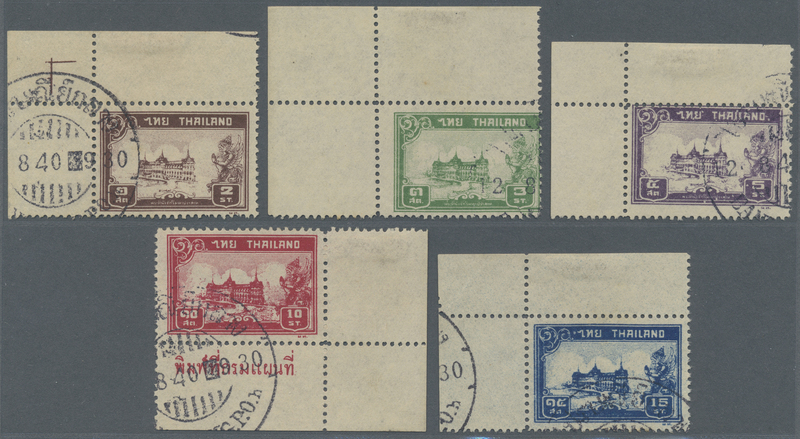 all tied by Bangkok '15.11.41' cds, with censor strip tied by "PASSED BY/CENSOR 307" h/s in violet, fine. 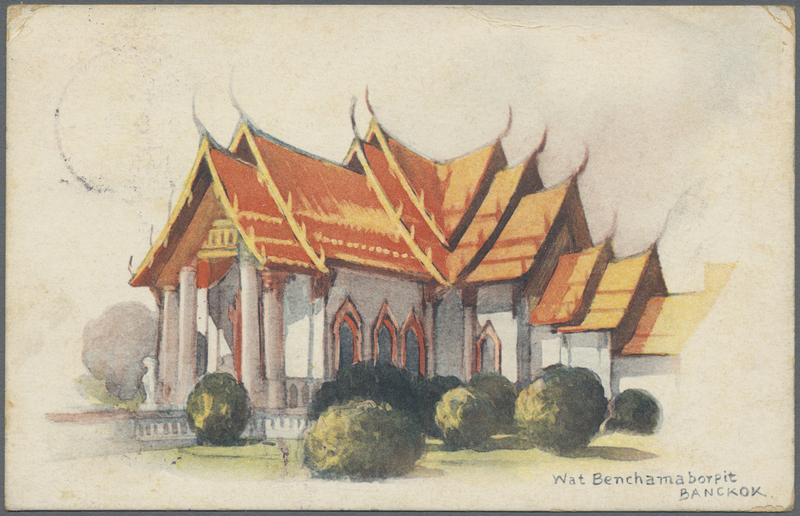 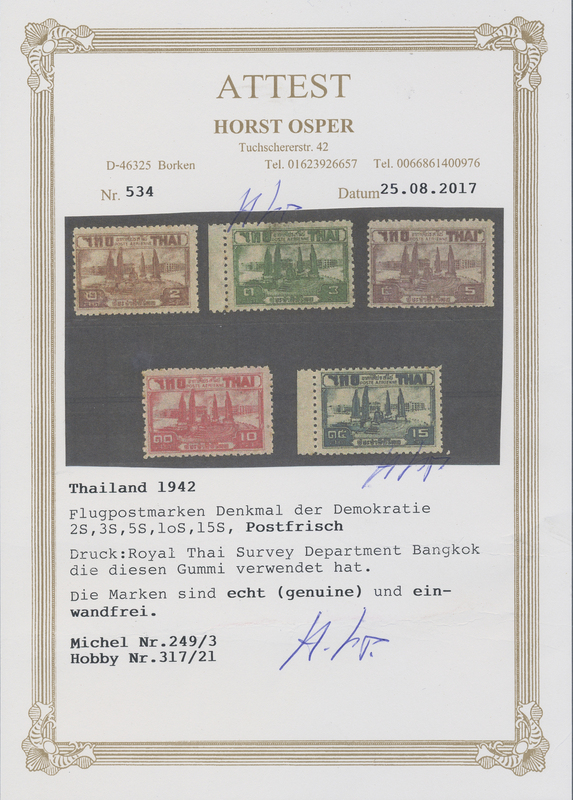 9873 Ansichtskarte (Picture postcard) 1942, 10 S. tied "BANGKOK G.P.O 20.8.42" to ppc to Okayama prefecture/Japan, circular siamese censormark "8", sender staff of MBK Bangkok. 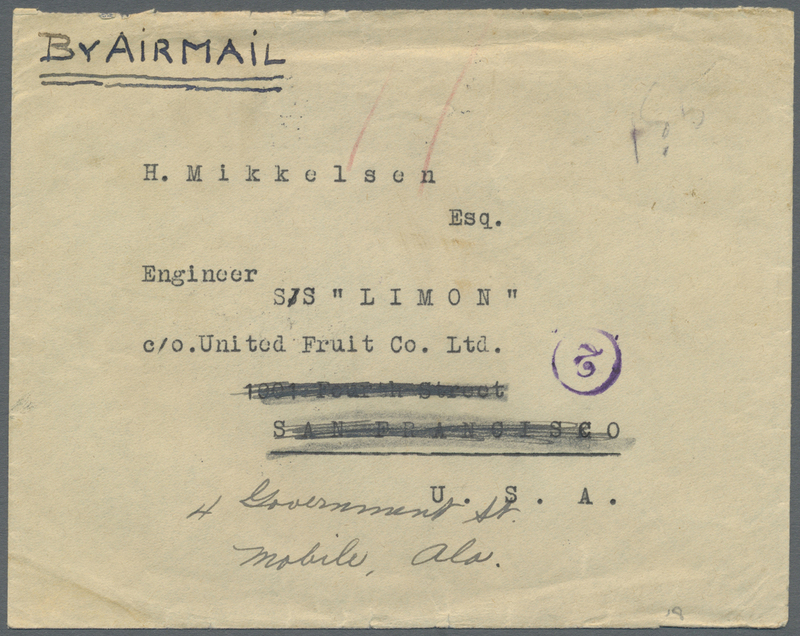 Original endorsement "Air Mail" deleted. 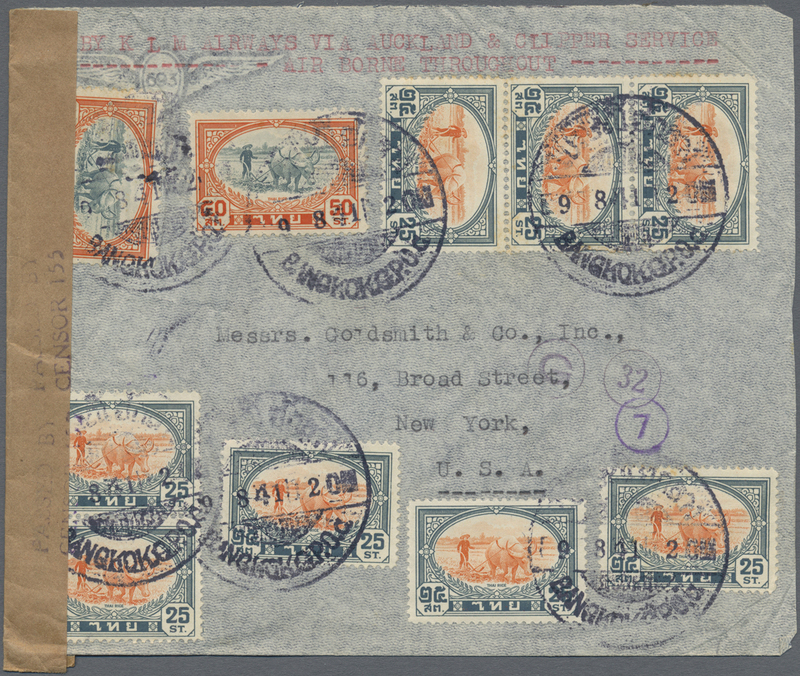 9880 Brief (cover) 260(2) et al. 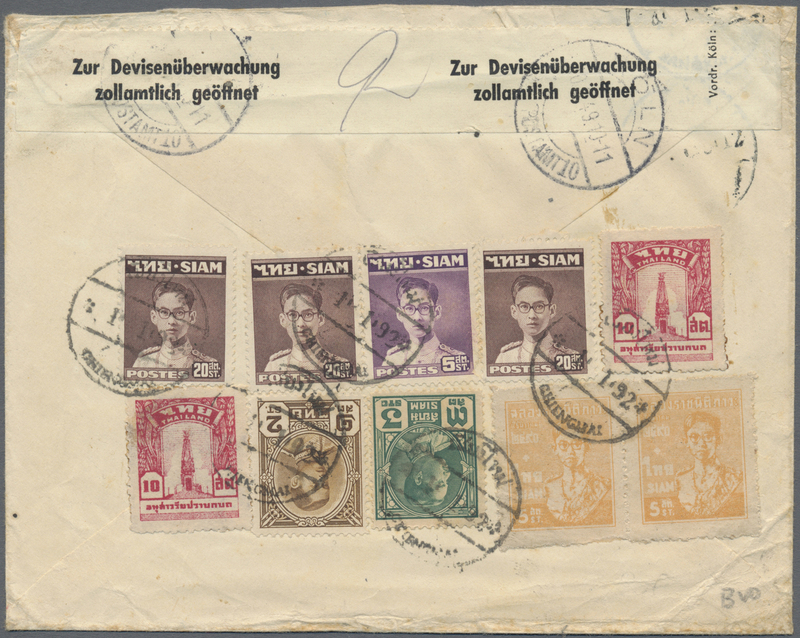 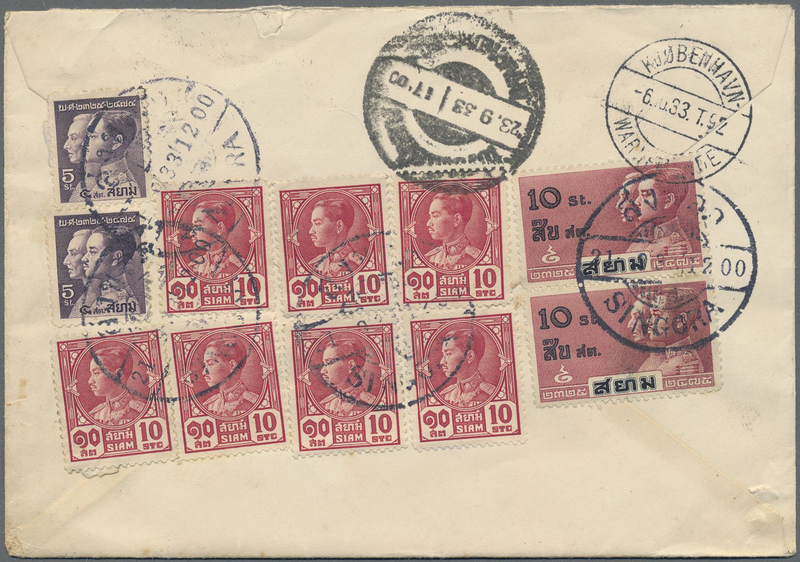 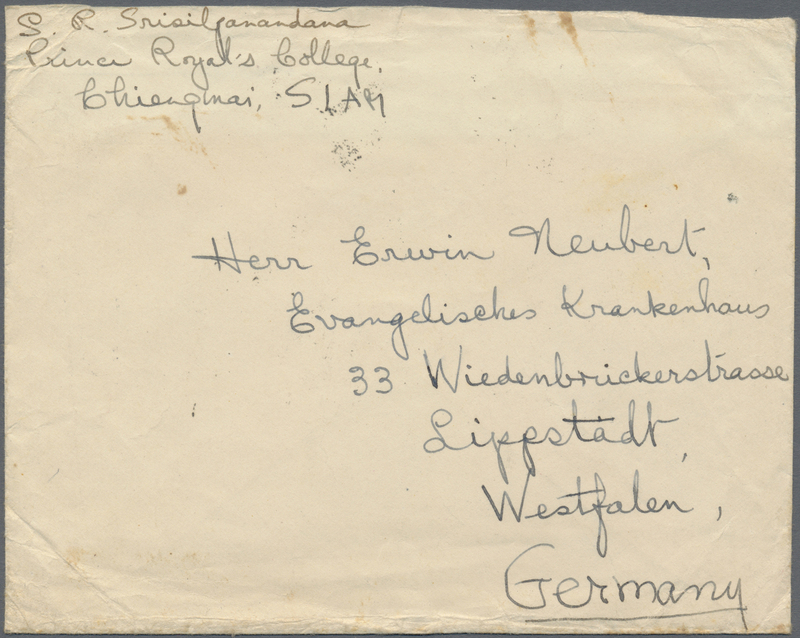 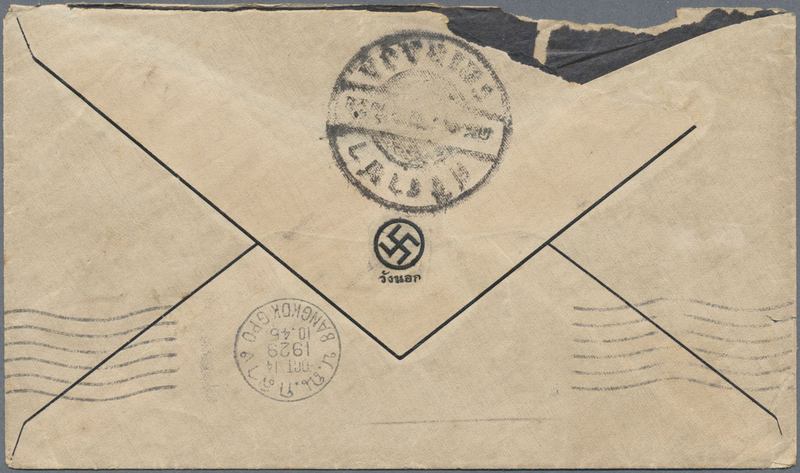 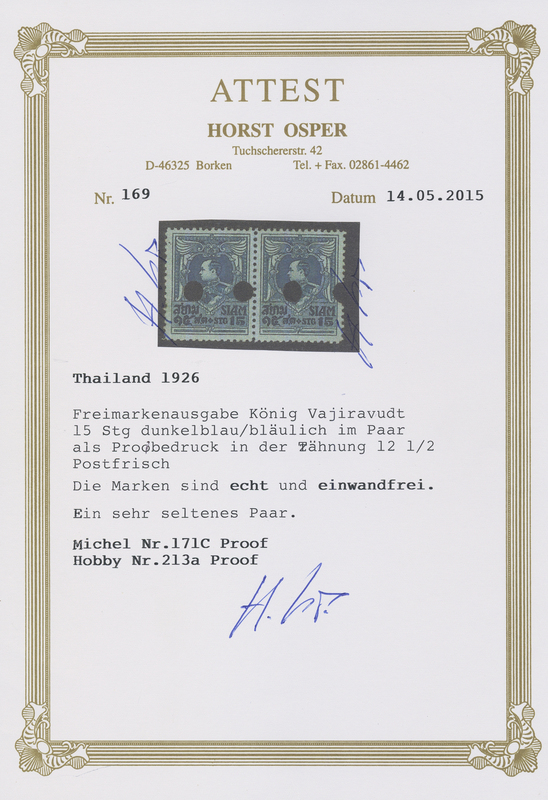 1949 cover from Chiang Mai to Lippstadt, Germany franked on the reverse by ten adhesives for 100s. 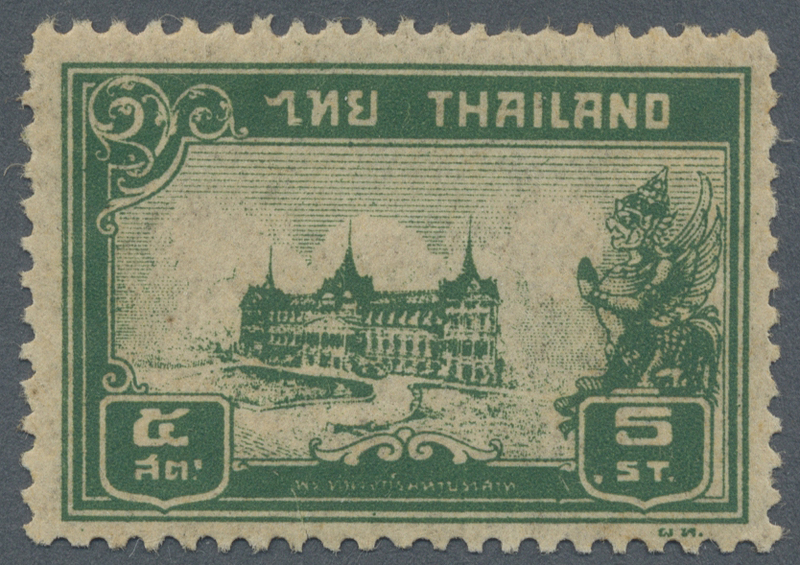 (= 1 baht) includin 1947 5s. 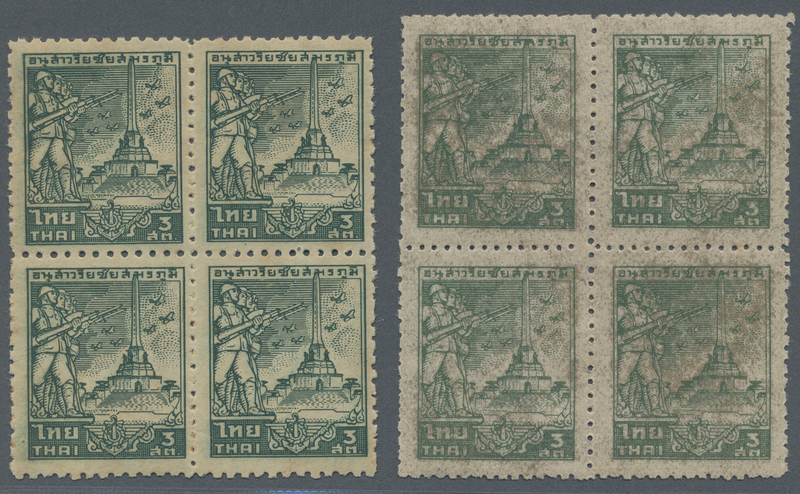 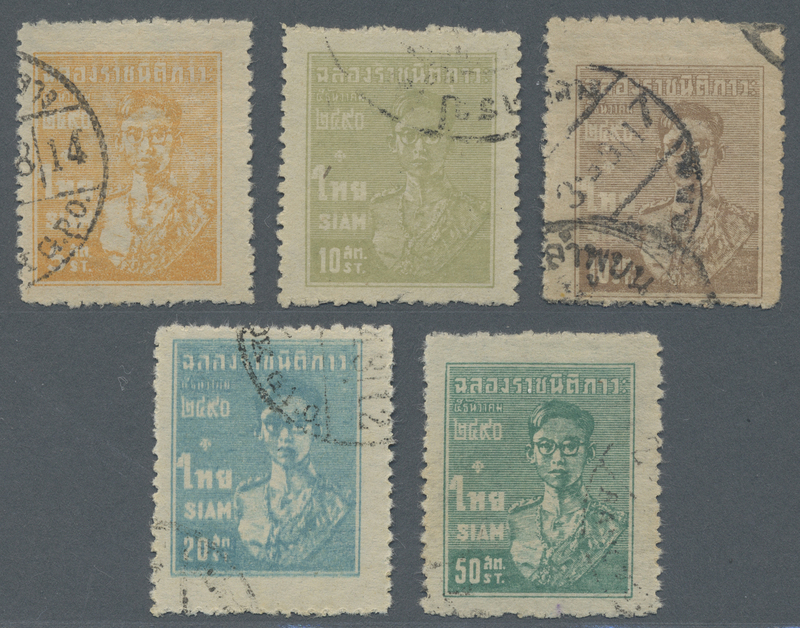 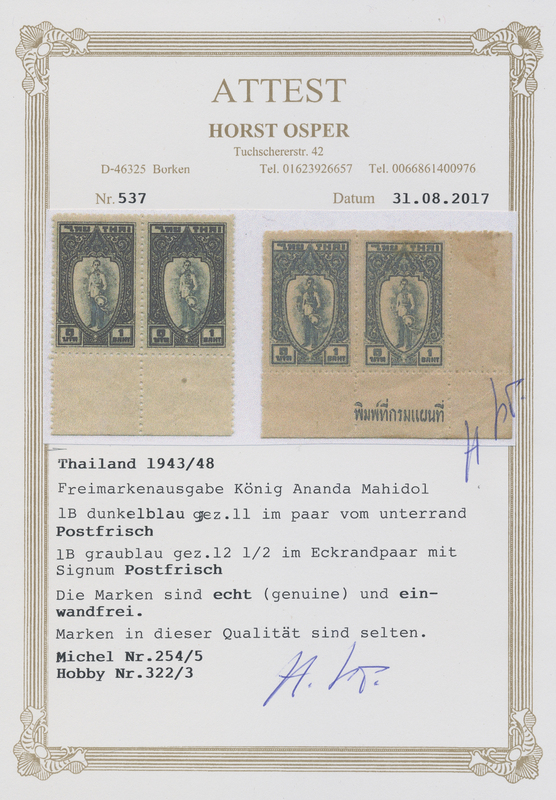 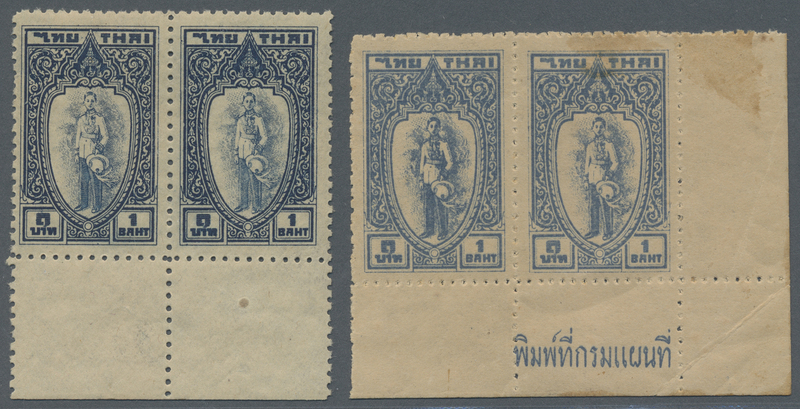 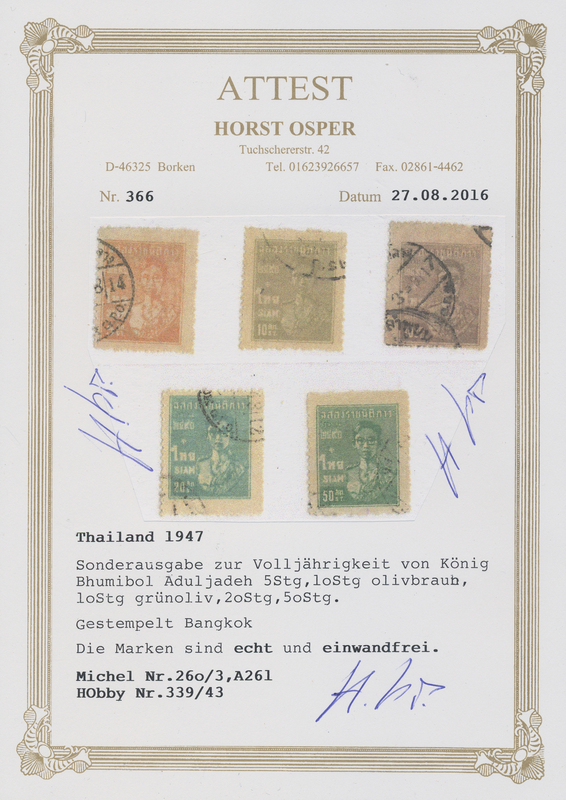 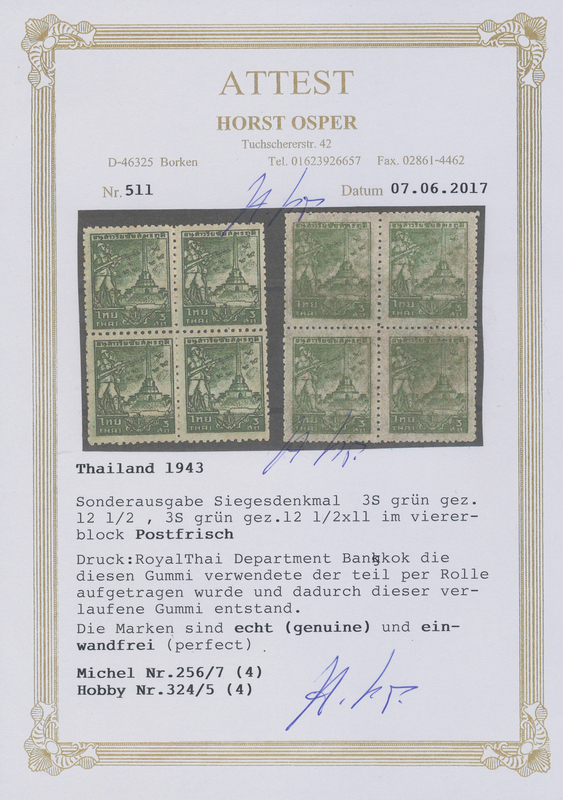 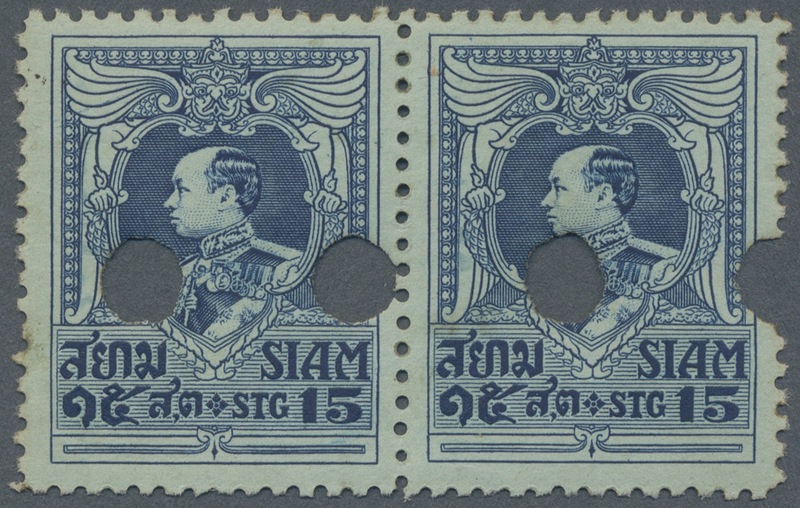 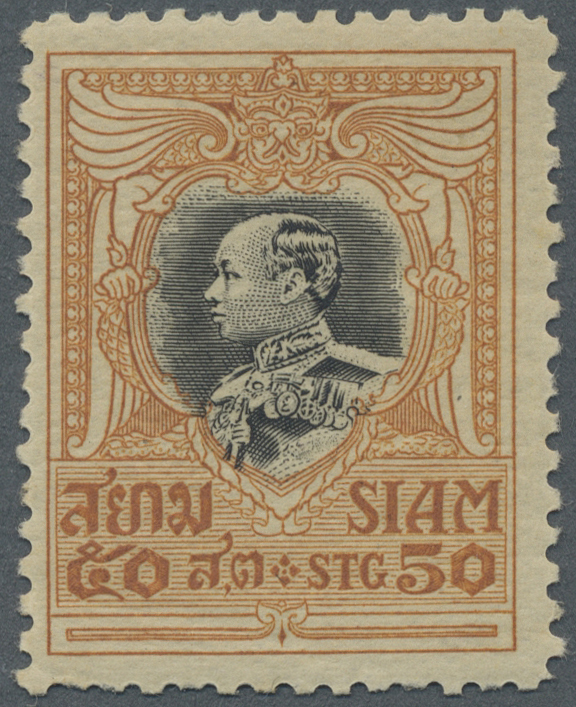 orange pair, all tied by bilingual "CHIENGMAI" datestamp, with part Bangkok transit datestamp covered by German customs strip tied by Cologne 1942 datestamp. 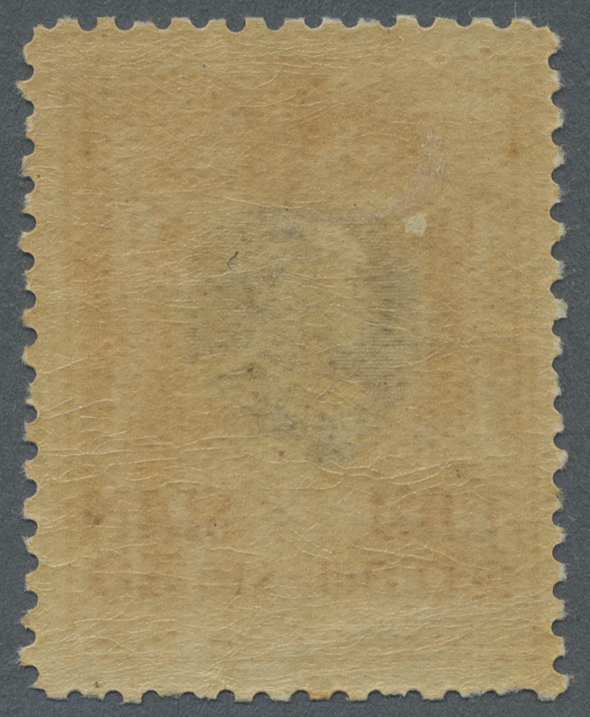 Cover with minor traces of use but unusual and attractive.